Versatile is an understatement for a young blue-eyed blonde who has stunning-stage presence. Her mom says, "Annabel's schedule is insane!" It doesn't seem to phase the 5'8" high school junior with her upbeat-friendly personality. Oh, and I'd like to mention that she's only sixteen and maintains a 4.0 GPA? Annabel Guptill was born in Huntington Beach, California. The proud parents are Scott and Celeste. She is the oldest of five sisters and two brothers -- that in itself tells you the busy life she's living. As a little girl, she lived near the beach and her life was moving from place to place. When Annabel was seven years old, her family moved up to Ontario, Oregon. She has been home schooled all of her life with the exception of a few elective classes at some public schools. At this age she also started taking lessons to play the fiddle and the piano. She has played instruments and sang since she could talk. She found a love for music at an early age. "I experienced moving around so much when I was young and realized how difficult it was being the new kid at a school. We didn't want that for our kids -- home schooling seemed to be a solution for us. In Ontario there was such a large community of home schoolers, we even had sports teams," her mom said. Annabel was raised in a calm middle-class neighborhood close to the Oregon-Idaho border. She hung out with a group of friends and she attended church functions regularly. When she was nine years old she'd often watch Bianca Thompson, a runner from the high school. Annabel was always beating her friends in races. One day she finally worked up the courage to ask Bianca if she would race her. Bianca was a good runner and of course Annabel was much younger. "I think watching Bianca really inspired me to become a runner. When I saw myself beating my friends in the neighborhood, and all my brothers and sisters, well, I'm older so I guess I should beat them -- ha-ha! I think that's when I realized that maybe I could be a good runner," Annabel said. Annabel loved competing for home-schooled teams like volleyball, basketball, and tennis. Her home school team would always win against many public schools in the area. "I remember playing tennis with a friend. There were runners going by. I would say, 'those people are so dumb, I will never run -- that isn't even a skill!' During volleyball our coach made us run a mile, and if you didn't run it under eight minutes you couldn't play," Annabel said. The grades that ran the mile were six through twelve and Annabel would win every time. In basketball she was always the first one down the court. She started finding a passion for running and started realizing that maybe she had found her sport. Although she loved basketball, the shots wouldn't always go in. Annabel struggled in reading as a young kid, but her mom persevered by helping her read Bible scriptures or anything that might help improve her reading. One day she just blossomed by reading the entire "Laura Ingles Wilder" series. "I couldn't believe it to tell you the truth. I asked her questions about the books and she answered everyone correctly," Celeste said. During her eighth grade year, the Guptills moved to the Willamette Valley due to a teaching job offer that her dad received in Silverton, Oregon. Annabel's mom posted a comment on Facebook requesting info on a home for a family of ten. Someone responded and they were able to move into a rental home in Keizer, Oregon. Home school has been such a blessing to Annabel. Her mom speaks of purchasing tests to take at different levels -- third grade, fifth grade, eighth grade, and tenth grade -- every state has different policies. She has the option of taking electives at the public school, and participating in sports. She is a member of the McNary Cross Country Team and the McNary Track and Field Team. "I enjoy home school because of the flexibility. I study by my own schedule and I can compete in sports teams at McNary. I'm able to spend time with my friends so I still get the social aspect as well," Annabel said. Although home schooling has it's pros and cons, Annabel finds more pros. She is improving every day while she works hard to become a great runner. Her training schedule is usually running at least 30 miles a week. Sometimes she'll run six miles worth of intervals for strength. Last year, her best time in the 3K as a sophomore was 11:53. She qualified for the state meet in Eugene, Oregon, but finished in the middle of the pack. "I got stuck in the middle of the pack right at the beginning and when I finally got past them, there wasn't enough time to gain what I lost," Annabel said. Annabel doesn't look at running in a way that she's the best, but she looks at running as a challenge for herself to get better every year. She wants to make it to the state meet again this year and place higher than last year. She wants to earn a spot on the McNary 4 x 400 relay team. Her best time in the 400 meters is 61 seconds, she hopes to break 60 seconds in the near future. While running keeps her active, she has such a passion for music. The God-given talent of playing several instruments, like the violin-fiddle, piano, and saxophone, has given her a whole new leisure of a positive activity that she loves. At sixteen years old she is an instructor and has ten clients, some that are special-needs. "Being a home schooled student gives me the opportunity to teach music lessons, I've been teaching the last three years. I enjoy teaching and at the same time I've also learned about life skills -- an amazing experience," Annabel said. Annabel is part of a worship team for her church, and is involved with Orchestra at McNary High School. She has recently become part of the Highway Home Gospel Bluegrass Band. She's a new member so her picture won't be part of that band yet. "We've never been parents that have pressured our kids, but we do recognize their gifts and encourage them as much as we can," her mom said. Annabel has a leader-type personality. When someone asks her a question, she'll give her opinion -- she'll tell it like it is. She organizes events for her team and friends and follows through. Her parents have supported her in so many ways. Her dad is out there timing her and giving her helpful hints on her running form, etc. Her mom is always teaching her about nutrition -- what the body needs to continue training. She's also the stay-at-home mom that puts in the hours for home school. Annabel's grandparents are also supportive. They moved to Keizer to help out the Guptills. "I'm so thankful for her grandparents, if we need something and I can't be there, they are always willing to help us out," Celeste said. Annabel is the type of kid that welcomes her little brother, Tyler, when he wants to go hang out with her entire team. She'll have him ride his bike while they run. Most kids these days will not want their little brother tagging along. She has a good heart and loves her family dearly. This year she qualified for a national competition in the Oregon Old-Time Fiddlers. She placed first at the state competition in the "Twin Fiddler" with Hyrum Kohler, who attends McNary High School. She placed second in the "Solo Fiddler" event. She'll compete at nationals this June 2015. "She is so nice and amazing ... and especially to all of her siblings, I'm so proud of Annabel," her grandma said. Annabel will be graduating high school at age sixteen, she's very young. Her dedication to running and music will continue. She would really love to run the 5K in college and is looking at Corban University in Salem, Oregon. Music is more likely as far as scholarship funds, but she plans to keep training and improving as much as she can on running. "I'm still young and have time to continue working hard even after high school. I would really love to run in college and be committed to music as well," Annabel said. Annabel's talents are mesmerizing, I can't begin to think how much work this young lady has put in over the years. For a long-term goal, she would love to continue teaching music, and eventually become an accountant. Starting a family some day is included in the list. When I asked Annabel to play the fiddle for me, I was expecting a young girl that played average. I was blown away! I almost started dancing with an injured knee. One can only imagine accomplishing so much as a young teenager ... congrats Annabel, you are a wonderful example for many people. Keep doing what you're doing. 1. Annabel, what are your favorite hobbies? I like playing the fiddle, making music, cooking and decorating cakes, and listening to country music. 2. What are your favorite subjects in school? I like science, history, and chemistry. 3. Who is your favorite athlete that inspires you? Eric Liddell, an Olympic athlete and missionary, inspires me. 4. What advice can you give young athletes that are following a dream like yours? Find your passion and work hard at it. I know I'm not the best at what I do, but I have the desire to improve every day. The $100.00 winner of the Espi Essay Contest is Noah Torres! Noah is a freshman at Moses Lake Christian Academy. This young man lives in Moses Lake, Washington. Congratulations Noah! Thank you to all of the people that entered especially Cameron Traeger, who was the youngest contestant – a fifth grader in Mt. Angel, Oregon – he gets $20.00 for his solid effort. Noah wrote a one-page essay on the book I published in 2011, Poor Kid, Wealthy Kid. Enjoy the essay which is posted below. David Espinoza has written a total of three books. NOZA: A True Basketball Success Story, The Professor - Grayson Boucher Plus More NW Sports Stories, and Poor Kid, Wealthy Kid. Noza: A True Basketball Success Story was about Matt Espinoza and all of the adversity he and his family overcame together. The Professor - Grayson Boucher Plus More NW Sports Stories tells the stories and the hardships each of the eight athletes overcame. Lastly, of all the books David has written, Poor Kid, Wealthy Kid is my favorite book. Every book he has written is amazing, but personally, Poor Kid, Wealthy Kid stands out to me as David's best book because tons of people can relate to this book, and also, it is his only book that is realistic fiction. In this story, the author tells of a young teenager named Carlos. He starts out as a normal kid in Dimmitt, Texas. Later he is forced to move to Gervais, Oregon. Just like any kid, he hates the idea of moving, especially because he has lived his whole life in Dimmitt. He has so many memories, friends, and sports teams he has played with. In this story, Carlos is a phenomenal athlete. To describe how great of an athlete he is, David writes that Carlos has an incredible and accurate arm. It was so accurate that when Carlos' family was low on food, his dad would make bets with people that his son would hit a road sign fifty yards away! Sure enough, Carlos would hit the sign spot on! Moving to Gervais was pretty difficult for Carlos, but because he was an incredible athlete, he attracted attention. Most importantly, this story tells of the poor kid, and the wealthy kid. Carlos becomes friends with a boy named Harv. Harv is not a great athlete, but he is a very wealthy and intelligent person. Carlos' weakness is maintaining good grades in school, and because Harv is pretty smart Carlos asks Harv for help in school. Eventually the two become best of friends. Harv has a sister named Liz. Later in the book, Liz finds herself liking Carlos quite a bit, but unfortunately, Liz's father prohibits her from being around poor Hispanic kids. The rest of the story goes on from there. This story is my personal favorite. I remember the day this book came in my mailbox – I could not put it down. I had to read what was next! I definitely recommend this book to everyone. The two other books this author wrote were really good, but I believe, for me, this book was the best – mainly because it has a great message. We all find ourselves fighting for who we are and what we believe in. We also find ourselves fighting for the people we love. In this novel, Liz could have listened to her father and stayed away from Carlos, but she didn't, she really loved Carlos for who he was. Later in the book, she tries to convince her parents that Carlos is a great person. That’s a problem in today's society. People judge other people by how they look. We also need more people like Liz. Standing up for the people we love. Author David Espinoza's message in this book is loud and clear. Hands down, this book is probably the best book I've ever read. Yes I think it's better than the Hunger Games, Harry Potter, Divergent, etc. Since it is the Christmas season, I would even recommend people to give this book to people they know who haven't read it. It would make a great stocking stuffer! This amazing book is a definite must read! Just talking to Ahmed and watching his smile you wouldn’t know what this young man has endured. He’s not your average high school student. He has a gift that he discovered, not in Ethiopia, but at Ron Russell Middle School in Portland, Oregon. He now attends West Salem High School and is determined to break some personal records in the 1500 meters, 3000 meters, and 5000 meters. Ahmed is the son of Abdiwahab Abdi (Dad) and Fardowsa Ahmed (Mom). He has four brothers and four sisters. His dad is disabled but still finds time to volunteer three times a week at AYCO (African Youth and Community Organization) in Portland – he enjoys helping kids. “When we were in Ethiopia, my dad fell down this deep hole on the ground that was meant for garbage. He injured himself severely and is limited on what he can do,” Ahmed said. His mom stays at home with the kids – she does daycare work as well. It’s very difficult for a non-English-speaking person to find work. During the summers it’s much easier. Ahmed grew up in eastern Africa (Ethiopia). He lived in a small town called Kabribayah close to a refugee camp – a lot of poverty in that area. For example, $50.00 in the U.S.A. is equivalent to $1500.00 in Kabribayah. He would walk six miles roundtrip to school every day. The school he attended is not like here in the U.S.A. He speaks of five-year-old kids through ten-year-old kids mixed in the same class. Every kid has the opportunity to advance at their own pace. Ahmed was known as the smart kid in his neighborhood. His friends would always come to his home to ask for help or to play. He was more than willing to help his friends. “I had friends knocking at my door all the time. I knew all of them by name. I’ll give you my educated guess of how many – let’s say around 200 friends,” Ahmed said. Ahmed speaks of how his family was in the upper-middle class in Ethiopia, but here in the United States that class would be very poor. Kids played everyday, soccer mainly, but there would never be a chance to advance – it was just for fun. “There wasn’t much money – plenty of poor kids running around everywhere. We would have fun and laugh all the time despite that hardship,” Ahmed said. In 2005 there was a United Nations’ program. Not being clear of all the details to this program, Ahmed speaks of how the officials were giving families the opportunities to relocate to countries like Europe, the U.S., etc. His dad and mom were not thrilled at first, but when they learned about a possible better education and life for their kids, they decided to apply for a chance at coming to the United States. It wasn’t easy as they had to pass a series of written tests, medical examinations, etc. They had to meet strict qualifications. The family was approved after a few years – they had met all the qualifications and were U.S.A. bound. Ahmed and his family arrived in Portland, Oregon, September 2011. He attended seventh and eighth grade at Ron Russell Middle School in southeast Portland. It was there that P.E. Teacher Mrs. Maccomber inspired this young man to become a runner. She had recognized how well he had done in the pacer test as a seventh grader. He scored 107 and later, 136. She also witnessed him running the 1600 meters in six minutes flat. “Hey Ahmed, You’re doing track right?” Mrs. Maccomber asked. “No, I’m doing soccer,” Ahmed said. “Ahmed, if you run the 1500 meters in 4:15 I will pay for all of your high school sports’ fees at David Douglas,” she said. 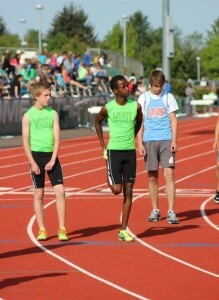 Ahmed came really close – he ran a 4:30 in the 1500 meters. The P.E. teacher was so impressed by his dedication and work ethic to try and meet her request that she agreed to pay for his fees. Ahmed started realizing that he could be a very good runner. He had never been part of a track club, but worked hard at improving. During his freshman year of high school his parents made a decision to move to Salem – about an hour away from Portland. They chose West Salem High School for Ahmed to attend. His brothers and sisters would attend there as well. West Salem is an area that consists of middle to upper-class families. In the flats there are more low-income families. Ahmed’s family settled in the flats. Ahmed is not your average high school student. His hobbies are not watching TV, going to movies, playing video games, or hanging out with friends. His hobbies are cooking for his family, taking care of his brothers and sisters, and interpreting for his parents, who don’t speak much English. In addition to knowing English, Ahmed knows three more languages – Somali, Amharic, and Arabic. “No one really knows that I enjoy cooking – especially Somali food. Back where I come from a lot of the people in the refugee camp were Somali. My grandma was really like my mother when I was growing up. I would help her walk across the street. My mom was always super busy with many things. Grandma taught me how to cook. She taught me many other things too – especially how to help people,” Ahmed said. One can only imagine how tough the adjustment must have been for Ahmed, coming from such a different culture and accomplishing the many things he has at West Salem. As a freshman and sophomore he was the district champion in cross country and in track and field events. He has run 15:03 in the 5K cross country. He has run 8:46 in the 3K, and 4:03 in the 1500 meters. He was recently named the 2014 SJ All-Mid-Valley boys cross country athlete of the year. “I run six days a week, and I realize I still have so much more room to improve. Running in the West Salem hills is great,” Ahmed said. Ahmed admits that at West Salem the people are different than where he was raised. He’s learning so much everyday and in the academic world he has improved to a 3.8 GPA. He speaks of how his parents have supported him by just simply loving him and encouraging him to have fun but work hard at achieving his goals in life. “The students at West Salem respect me because I’m a great runner. People tell me I smile all the time. I don’t have many real friends here, but I think I have a lot of fans here. They treat me good, maybe there’s some drama here and there, but not any different than any other student,” Ahmed said. As a runner, Ahmed is the type of person that encourages runners that compete against him. He likes to support his competitors. One of his favorite memories is coming from behind and winning a race. At the end of the race, the person he passed up congratulated him and said, you are great man! Ahmed has a long term goal of being the OSAA 6A State Champion in cross country and in track and field – he believes he can do it by his senior year. He would like to break 4:00 by running a 3:54 1500 meters, and he would like to break 8:46 by running an 8:25 3K. I wish him the very best and I’m rooting for him all the way. Keep on going Ahmed, never give up. Ahmed was interpreting for me as I asked his mom some questions. “I’m very proud of him. I want him to be successful … first in education and then in sports. We are all adjusting good here in the U.S.A.,” his mom said. Ahmed, what are your two favorite moments in running? Winning the 3K at the Twighlight Relays as a freshman and winning the 5K at the Harrier Classic in 2014. My favorites are Computer Science and World Geography. Mo Farah, a Somali-born long distance runner from Great Britain. What advice can you give a younger athlete? Give it time. Don’t give up and stay positive. The holidays are approaching fast and I thought to myself, I have to do something for my readers – I appreciate them so much! Most people can certainly use some extra cash this time of the year. Yes! An ESPI ESSAY CONTEST is perfect. Starting immediately, all you have to do is write a one-page essay on any of my books. You are welcome to use two pages, but not necessary. The winner will receive $100.00 cash. Deadline to enter this contest is December 16th, 2014. Winner will be announced on December 24th – Christmas Eve. Their essay will be posted on my website. Send a one-page essay to: David Espinoza, P.O. Box 20393, Keizer, OR 97307. I live in Salem, OR, but my P.O. Box is in Keizer. Of course … you have to read one of the three books I’ve written. To order autographed books, mail a check or money order payable to David Espinoza. Look at the top tab "Order Autographed Copy" for retail prices and order information. You can also order through Amazon, just click one of the book covers to the right. Everyone is eligible to enter except my immediate family members (sorry family). Thank you so much for your support and encouragement through all my author experiences. I’m looking forward to releasing my fourth book “Poor Kid, Wealthy Kid II”. I’m excited to read your essays – Good Luck to all! This heart-touching story is about a girl who was born prematurely and later diagnosed with autism and other developmental delays. Her challenges through school were beyond imaginable, but that didn’t stop her from experiencing something she calls “amazing!” Only few people in this world will ever experience what she did. Eunice Kennedy Shriver said it the best back in the 1960s. She started looking at people with disabilities, but it wasn’t for “what they couldn’t do” – it was for “what they could do”. She made the first Special Olympic Games happen in 1968. Jenny Hill is the daughter of David and Sue. She has an older brother, Chris, who is married to Jenny (same name), they have two kids. Jenny was born in 1986, in Newport, Oregon, right next to the ocean. The family made their way to Brownsville, Turner, and then in 2010 ended up in Salem, Oregon, where they now live on the south side. Before Jenny was born, Sue went through a very difficult pregnancy. She returned to OHSU eleven times for ultrasounds. Jenny was born premature. As an infant she met most of the developmental milestones except for the language part. Her parents noticed that she would not spit up like a normal baby, which is through the mouth. She would spit up through her nose – she had to be monitored very carefully everyday. Jenny did not talk for a very long time. At three years old she noticed that her brother had an accident and injured himself. “What did you do!” Jenny spoke for the first time. Everyone forgot about her big brother being hurt and turned to Jenny, she spoke! It was a joy to hear sounds coming out of her mouth. During kindergarten, Jenny was diagnosed with autism and mental developmental delays. Later she was also diagnosed with polycystic ovarian syndrome (an illness characterized with irregular or no periods) – higher risk for obesity and more. “Mostly for me, I was in denial – I figured by the time she was fifteen or twenty, no one would know the difference. This was going to be part of life,” David said. Both parents dealt with a tough situation, when it’s your own child it hits you harder than ever. They were going to love Jenny no matter what – whatever they could do for her they were up to the task. “I just thought to myself, it is what it is, now we need to start thinking about what we can do to help her,” Sue said. It was then that Sue and David realized something was in there and the possibilities were limitless of what they could do for her. Sue enrolled in a sign language program to learn and to become an interpreter – she felt this was needed to help Jenny. Jenny attended grade school in Aumsville, Oregon. During middle school she attended Cascade. Life was challenging for her. It was very difficult for her to be social – interacting with the other kids became a huge obstacle for her. She didn’t know anyone and lunchtimes were lonely. “Because of her cognation and autism, it affected her a great deal. She wouldn’t wear the same clothes as other kids or talk the same way. I would often go visit during lunch and I would find Jenny sitting by herself at a different table in the cafeteria,” Sue said. “Facing my autism, my shyness, not knowing anyone – that was tough,” Jenny said. Jenny met John Hawkins – a boy in grade school that became like a brother to her. She never really talked to him because of her shyness and social challenges. “I never talked to him the whole time – he was across the hall from me,” Jenny said. When they were promoted to middle school, John made it a point to give all the girls in class a flower. Jenny was touched deeply when John gave her one too. From middle school through high school, she would receive a flower and a dance … once a year. John always made sure that Jenny had at least one dance every year. “I was looking for something that Jenny could do to get her more involved. Special Olympics was a program that anyone could do if they had some sort of a mental development delay disability. I started coaching her in swimming and then it led to other sports,” Sue said. Jenny started getting into many sports in Special Olympics. She started with swimming, then basketball, power lifting, and gymnastics. She would practice with the team once a week. Her main sport event eventually became gymnastics – she had the talent to go a long ways. “They worked me pretty hard – I learned so much during practices,” Jenny said. While she continued to improve in all of the sports, the one sport that she really excelled in was gymnastics. The uneven bars, beam, the vault, and the floor exercise seemed to have adapted well with Jenny. She was coached by many people in different events throughout the years. At a level-3 category (top level) she would need a private instructor. She met Sveta from Russia, who became her major coach from the fifth grade to her junior year in high school. Jenny started competing in Special Olympics at age nine. She found a passion – something she could be involved in – she made a difference and it was starting to be a life-changing experience. Her entire family coached her in one thing or another – they volunteered many times. In 2003, Jenny had placed high at the state level and advanced to the national games in Ames, Iowa. At this meet she received a gold medal in the floor exercise, a silver medal in the vault, and bronze in the beam and bars. In June, 2003, Jenny was headed to Dublin, Ireland, to compete in the Special Olympics World Games. There were about 70,000 people attending this major event. Jenny and her parents stayed with a hosting family from Ireland – they were very kind to them. There was an overload of security because of the Iraq war going on at the time – a little nerve-racking. “It was amazing! The meals were free and so many things were provided for us. I made new friends and it helped me gain a little more confidence in myself,” Jenny said. Jenny had done very well so far. She had placed fourth in the floor exercise and she received a bronze medal in the bars and beam. She was getting ready to compete in the vault apparatus. During one of her warm-ups, she was running on the runway, stepped on the springboard, and hit the horse awkwardly and she fell hard to the ground. Her mom, Sue, was stressing a bit. There were hundreds of people watching since it was the only apparatus left. Jenny got up and went over to talk to the coach. It seemed as if she had gathered her composure. The coach said a few words to her and gave her a pat. Jenny’s turn comes up for the real one this time. She salutes and hits the runway – she approaches the springboard and hits the horse perfectly followed by sticking the landing – the crowd went wild as she raised her hands up in the air. She nailed it not only once, but twice. This earned Jenny the gold medal! She also went on to place fourth in the all-around competition. “At the awards ceremony, she was standing at the top between the silver and bronze medalists. They presented Jenny with flowers and the gold medal. I was so proud of her. When I saw Jenny turn around and toss her flowers to our host family from Ireland … it was a very touching moment,” Sue said. Jenny’s experience with Special Olympics has given her so much. The hard work she put in and the determination to accomplish what many only wish, has been such a blessing to her. “Special Olympics have taught me how to lose weight, make friends, and communicate with people. I really want to bring awareness to Special Olympics. I feel blessed that I got to go to Ireland and compete there at no cost. I especially feel blessed to have parents like mine – they have helped me so much,” Jenny said. Jenny went on to receive the Governor’s Gold Award for two years - presented by Ted Kulongoski (governor at the time). Jenny presented medals she earned to John Kitzhaber in a different year. Jenny also received the Lou Burge Award at the Oregon Sports Awards and an opportunity to speak live on television – KATU Channel 2. Although Jenny’s gymnastic career came to an end due to an injury she received while practicing, she learned so much. It’s still a challenge as far as communicating with people – especially in a large group setting, but it’s a lot better than before. She now enjoys playing a game called bocce, bowling, and horse-riding lessons. Don’t be surprised to see her at the bowling alley. John Hawkins went on to become the class president and the homecoming king at Cascade High School. Jenny not only got flowers again, but she had the honor of dancing with the homecoming king. Jenny was involved in FFA during high school and found a love for animals. She now works for Aumsville Animal Clinic. Her employer has been so good to her – she really enjoys working there as a kennel tech plus other minor duties. Jenny, what was your favorite subject in school? Who is your favorite Olympian athlete? Carly Patterson – the 2004 all-around champion in gymnastics. I had the honor of performing a routine on the uneven bars at the Rose Garden (now Moda Center). Carly spotted me in front of thousands of people. Afterward she gave me her USA jacket. Why Pass Judgement on the NFL? Recently I’ve read and listened to negative news surfacing on just about all sorts of media pertaining to the NFL (National Football League). I’m feeling a little disappointed that people can pass judgments on the entire organization for bad decisions that are being made by some players. Don’t get me wrong, I’m totally against bad decisions being made by any athletes, teachers, priests, pastors, kids, coaches, etc. – I think you get my drift. My concern is that people might be overlooking the fact that there are some amazing athletes in the NFL or in any other sport for that matter. For example, take a look at Archie Manning – a great quarterback during the 1971-1984 seasons who played for the New Orleans Saints and the Houston Oilers (now Houston Texans). Archie has three sons, Peyton (quarterback for Indianapolis Colts and now Denver Broncos), Eli (quarterback for the New York Giants), and Cooper (career ended at Ole Miss) who not many people know about. If you get a chance, watch the documentary “The Book of Manning” on ESPN Films – you’ll need Kleenex. I really enjoyed this story, not only because I have two sons and I can relate deeply, but because of the example of love and care that this family has for each other. Cooper was drafted to play at Ole Miss – he would follow his Dad’s footsteps. During his freshman year at Ole Miss, Cooper was diagnosed with spinal stenosis (a narrowing of the spinal canal). Peyton dreamed of playing with his brother, Cooper, at Ole Miss. When Cooper was forced to end his football career, well, I really feel that Peyton’s decision changed and he headed toward Tennessee. His dad respected his decision and supported it. To Peyton, I think he knew that it would not be the same not throwing to his 6’4” brother who had become a stellar wide receiver. Little brother, Eli, redeemed the family tradition and followed his Dad’s footsteps and headed to Ole Miss. It was a little different situation and the entire town was celebrating. The pressure of facing the public had turned around for the good. Archie’s family has been blessed with such a successful NFL story. Sports are supposed to be fun. They are not for stereotyping. It doesn’t matter what the fun may be – music, science, or gardening. If you’ve never made a bad decision in your life, then I guess it’s okay for you to judge and gossip and spread negative things about the NFL or sports in general. If a person makes a bad decision – we have the law and justice that should be served. Instead it seems like we point fingers and look for blame. Shouldn’t we be focusing on resolving and treatment – help for the people that need it? And most important, once a person has served their time (paid for the price) shouldn’t forgiveness be followed? There are so many positive things about sports, the more we focus on those (especially in the media world) the less we will stereotype. If you have kids, get involved with them and support them in having fun participating in the sport or sports they enjoy most. If you don’t have kids, volunteer in a sports program, or get involved in a big-brother or big-sister program and help them. Teaching kids good values at a young age can make a big difference when they become college or professional athletes – they will be in a better position to make good decisions in life. Even if there are thousands of kids with issues, I certainly understand that it’s impossible to have a huge impact on all of them, but to that “one kid you helped” it will make a difference. It all comes down to one thing, “love others”. Alex Roth was offered a walk-on spot for the Oregon State University Men’s Basketball Team this past season. He impressed former Coach Craig Robinson enough to finally get into the playing rotation next season. Everything was clicking for him and it seemed as if he would be traveling with the OSU Beavers and contributing in 2015. Alex is the son of Michael and Leslie Roth. He has a sister, Alyssa, and two half brothers, Jason and Danny. His dad is the owner of ten IGA stores in the northwest and his mom works as an office administrator. His grandfather is the late Orville Roth and former owner of the IGA stores. Alex was raised in a middle-to-upper-class neighborhood with plenty of friends to run around with – everyone knew each other. He never had any real issues with friends while growing up. Some people might describe Alex as a happy kid and very social – he smiled a lot. One day his older brothers were playing basketball in the backyard. Alex discovered that he wanted to give basketball a shot. Alex was little and loved hanging around his older brothers. They inspired him to start playing the game of basketball. He was fast and could jump – and eventually developed a great shooting hand. His brother, Danny, eventually went on to play at Western Oregon University. Alex was close to his Grandpa Orville. His dad was always working – a busy man. It was Orville that took him to the games and spent a lot of time with him. “My grandpa was my inspiration for a lot of things. He was the type of grandpa that took me out for ice cream after a game – we hung out together – he was a great guy,” Alex said. Alex attended Chapman Hill Elementary School, and then Walker Middle School in Salem, Oregon. During that time he played on an AAU traveling team, Salem Select. His freshman year at West Salem High School, he became a starter. He was contributing as a freshman but was a little frustrated due to the struggles that some teammates were dealing with. “I remember my freshman year at West our record was 5 – 20. By my senior year we improved to 24 wins and 3 losses,” Alex said. Alex admits that during his high school days, one of the obstacles was staying straight and not falling into the drug scene like some of the other players. That lifestyle definitely ruins players and their futures. “There’s a lot of peer pressure, but I just wasn’t into that – I just focused on choosing the right road – I wanted to play college basketball and I knew I had to be straight,” Alex said. He played with a Nike team – EYBL (Elite Youth Basketball League). That team traveled to many cities to play in tournaments against other teams that had talented athletes. “I did the Nike EYBL for awhile, but then I wasn’t comfortable with the way everything was just given to you – they put you on this high pedestal. I like working for what I get,” Alex said. His sophomore year and junior year in high school, Alex started putting in some hard work during the off-season. He trained with Kevin Turner and Matt Espinoza www.coachnoza.com– two performance development coaches. 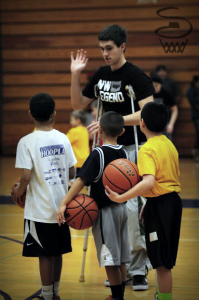 Whether it was lifting weights, basketball drills, or running steps at WillametteUniversity, it didn’t matter to Alex. He just wanted to excel as an athlete and prepare himself for the future. Boise State discovered Alex during a basketball tournament in Idaho. This was before his senior year of high school. They were very interested – they recognized his talent. Alex verbally committed to Boise State early on. He had also made plans to join a prep school for his senior year and not play for West Salem. “No one had contacted me – it was AJ Lapray from Sprague High School that was the big U of O commit – a lot of the attention was focused on him. So I jumped at the chance with Boise State. Later on I started getting letters from all sorts of Division I schools,” Alex said. Alex decided to decline the prep school idea – he remained at West Salem for his senior year – the coaches were happy to hear that. In the 2012-2013 season he helped the Titans win the CVC Championship. They also advanced to the first round of the state playoffs that year. The 6’ 4” guard averaged 28.5 points, 10 rebounds, and 4.5 assists. He led all scorers in the state of Oregon. He was named to the first-team All-Central Valley League and he captured the CVC Player of the Year Award. He also earned the All-Mid-Valley Player of the Year honor. One of his all-time favorite moments was beating the Sprague Olympians who had standouts like 6’ 5’’ AJ Lapray and 6’ 10” Tanner Morgan. Alex scored a game high of 31 points at that CVC match up. Another favorite moment was shattering the glass backboard on a dunk against North Salem. “I never really cared about points, but it felt so good to win against a team that had real good talent,” Alex said. Alex’s grandpa had a store in Corvallis, Oregon. The OSU Beavers would come into the store and buy food regularly. Orville got to know the players and some of the people there. He fell in love with Oregon State. “When I found out how much my grandpa loved the Beavers, I decided to not attend Boise State. I really wanted to make my grandpa proud,” Alex said. Alex was headed to OSU. Coach Craig Robinson liked what he saw. He wanted his incoming freshman to redshirt the first year. There are so many benefits to redshirting. You get to learn so many things about the program – the offense and the defense take time to learn and what better way? Weightlifting is a must to get stronger the first year – Alex needed to get stronger and bigger – he would spend 7 hours in the weight room during workouts. He had a chance to get prepared for the following year. During the practices Alex was so thankful for the opportunity to play against the starters every practice. He was one of the players chosen to run the scouting offense. His jersey number would be 22. “I’d have to say that my freshman year was amazing! During practice I was playing against the starters and actually scored on them. I think one practice I scored 50 points while scrimmaging,” Alex said. Alex was very close to his Grandpa Orville. The future looked bright and it seemed that someday his grandpa would watch him from a front-row seat at Ralph Miller Court – formerly known as Gill Coliseum. Orville had taken a vacation trip to Hawaii. He was relaxing while sipping on some wine with a few friends. He went to the bathroom for a break and then after that he fell down to the ground – he was struck with a heart attack. Alex received painful news. It was not an easy thing for him to hear. He lost his friend and his inspiration. “It was tough to handle. I was honored to speak at my grandpa’s funeral with over 2,000 people attending,” Alex said. Alex played in his first college exhibition game against Corban University wearing number 22. The entire OSU team wore black in honor of his Grandpa Orville. “It was an honor to play representing him – I know he was smiling down on me,” Alex said. Moving on – he fought through tough times. The college life is very busy with so many things going on and so many things to do. His grades were good and his drive to become a better player increased even more. One day, during a practice, he discovered that all of his shots were falling very short of the rim. He did not have the strength to lift his shooting arm up – it was a huge struggle. He didn’t know what was going on with his body. Was it possible that he had been overworking and his body was struggling to keep up? On February 14th, Valentine’s Day, Alex came down with mononucleosis – a virus that is transmitted through saliva (often referred to as the kissing disease). One can also be exposed through coughing or sneezing. The doctors discovered that he had mono and shingles. The mono came in and attacked the shingles in the long thoracic nerve (located in the back of the shoulder) and almost killed the whole nerve. The complexity of this rare occurrence is one that had not been seen before. Not to add anymore, but Alex had also injured one of his muscles in that area while lifting weights. “Everything happens for a reason – I really believe that. I can’t dwell on this, but I just keep saying to myself, if I can look up I can get up,” Alex said. This set Alex way back – he can’t even lift his arm up. Alex is doing some therapy and running a lot these days. The long thoracic nerve takes a very long time to heal. His attitude is beyond what anyone would expect. He’s staying very positive through this and is very hopeful for a comeback. “If I’m not healthy by next season I plan to apply for a medical redshirt – until then I’ll keep working out – I’m not giving up. I challenge anyone out there to be in better shape running-wise than I am right now,” Alex said. Alex faces many challenges in his early college basketball career. With the recently departed Craig Robinson, a new coach has come into the program. Wayne Tinkle, who coached at the University of Montana, will be the new head coach. “I had a great relationship with Craig Robinson, I don’t know what’s going to happen with the new coach – I’m just taking it a day at a time. I feel that things happen for a reason – I mean, what are you gonna do?” Alex said with a smile. I’ll be praying for Alex’s speedy recovery, he is such an amazing athlete and full of life. I wish you the best Alex. Alex, what is your favorite subject in school? I’m a business major, and I like Geography and Physical Science. I like hiking, boating, swimming – outdoor stuff. Favorite NBA team and college team? Blazers – rip city baby! Oregon State is the best team in the world! What advice can you give a young athlete? Life throws things at you – there will be setbacks. It’s all about overcoming. If you can look up you can get up. What is your goal at this point? I want to get back healthy and I want to improve my GPA from 3.1 to something better. Why do kids drop out of sports? There are several reasons – one of the biggest is, I’m not having fun. That’s right, part of the reason I was a three-sport athlete in high school was because it was fun for me. I enjoyed many aspects of playing sports – scoring touchdowns in a football game – hitting a winning shot in a basketball game – winning a hurdle race in track and field. It was fun and I have precious memories of many positive experiences. There were challenging moments, don’t get me wrong, but the fun and joy that I experienced superseded the downfalls. Because I enjoyed sports I was able to pass that on to my two boys. They went on to do great things in the world of sports. Based on my experiences around athletes, surveys I’ve looked at, and results from working with an athlete, well, the answer to me is “Technique”. What does technique mean? It’s the body of specialized procedures and methods used in any specific field – in our case sports. Let’s take basketball for example, since that’s one of my favorite sports. There is a technique to every skill. How to shoot the basketball – such a simple technique but yet I see a child shooting the basketball the wrong way every day. The legs must be squared up with the knees bent slightly, the ball held the correct way with one hand under the ball while the other hand supporting the basketball. When the ball is shot there should be a correct motion with your arm pointing at the rim and a follow-through with some wrist action (like you’re putting your hand in a cookie jar). The basketball must have an arch while in the air. There is also a technique for a defensive stance and foot movement, dribbling the basketball, etc. I think you get the idea. When an athlete has the technique down, next comes the toughest part. Practice makes better, no not perfect, “better”. No one is perfect except Jesus Christ. I really don’t like the phrase “practice makes perfect”. With any athlete it’s so important to let them know that it’s okay to make mistakes. The more you practice the better you’ll get and the more automatic it will be. It’s so important to do research on the person that is coaching your son or daughter. Does this coach have a passion and the knowledge for the sport he or she is coaching? Has he or she played in college or professionally? Coaching styles can also affect the results of having fun or not having fun while on a team. Basically, your child will not learn and grow in the sport unless the correct knowledge is being fed. Let’s get back to the fun part again and what will keep your child playing the sport they love and enjoy. When the athlete has mastered the technique, that’s one less thing they need to worry about while playing with an organized team. The coach will see that your child can make a positive impact in a game. Your child will only need to focus on the plays the coach designs and instructs. Your child will be contributing more to the team – coaches want that. And when your child plays more, he or she will have more fun! I’ve heard so many parents complain. One of the common complaints is, “There’s just too much politics”. Talk like that in front of your child and they’ll start to believe that. But in reality, maybe evaluate the skills that your child has and how well they have mastered the techniques needed for that sport. To have fun is to participate in the sport you signed up for. Playing in a game and feeling like you were a part of that victory. Laughing with your teammates or being good sports about a loss. A great website that I enjoy reading is www.coachnoza.com . This is my son’s website, he is a high school basketball coach. He played college basketball at Southern Oregon University and two years in a minor-professional league. He has great knowledge and runs a program called Salem Hoops Project. Now go out there and master the techniques for the sport you love! It’s easy to see the pastor when you walk into the Mission Fellowship Church in Salem, Oregon. Hans Rasmussen played basketball at The University of Notre Dame. He stands at 6’ 10” and enjoys greeting people. This young man is a humble person that really doesn’t realize how great of a job he does sending the Lord’s message to people. Hans (pronounced Hawns) is the son of Larry and Penny Rasmussen. He has two older sisters, Lissa and Kari. Both sisters were outstanding athletes. Kari who is 6’ 3” had an amazing college basketball career at UC Irivine. Lissa went on to become one of the top x-country runners in the state of Idaho. Later she became a crew rower in New Orleans and excelled in that sport. Hans grew up in Coeur d’ Alene, Idaho. His family lived there until he was six years old. At that time he lived in an upper-class neighborhood – his dad was an architect. The economy was always a factor – his parents always found a way to support the family. They would eventually move to Hillsboro, Oregon – Hans was nine years old. His sister, Kari, became an all-star player for Glencoe High School. “I remember moving a lot as a young kid, we were never at one place long enough to have friends that I knew well – my dad worked a lot,” Hans said. Hans wasn’t that big of a sports fan as a young kid, but it was his sister Kari that inspired him to start playing basketball. The basketball coach at Glencoe told her she could get a scholarship to play college basketball if she worked hard at it. “I idolized my sister – looked up to her. We were at a park near the Sunset Boulevard where my dad was helping her with some basketball drills. I wanted to have a better relationship with her. I think for me, sports are great because of that relationship aspect. Anyway, I started shooting the basketball at this small hoop while she was practicing – I figured if I started playing more it would connect us better,” Hans said. His dad, Larry, coached a home-grown fifth grade tournament team. Hans was on that team but had struggles because of the high expectations his dad had for him. “I hated it. It was not fun for me. But now that I think back on everything, I know my dad just wanted the best for me,” Hans said. Attending many grade schools, Hans remembers Boscow Elementary School – the last one he attended in Hillsboro. He was a tall skinny kid among his peers. He would often get picked on due to his somewhat uncoordinated body. He didn’t seem to fit in with any groups. He wasn’t that athletic so the athletes weren’t too interested in him. He was somewhat of an athlete so the smart kids wouldn’t want to hang around him. “I didn’t feel like I was one of the cool kids, I didn’t really fit in with any groups. I did manage to have a few friends, but basically jumped around from group to group. I also hadn’t figured out how to stick up for myself at that age,” Hans said. In the seventh grade at Evergreen Middle School, Hans became friends with Jim who was an amazing athlete. He started playing basketball with Jim regularly and improved drastically. By the time he was in the eighth grade Hans had become a good player. Hans was a tall kid and with the skills he had acquired the head coach at Glencoe started taking an interest. The coach was excited about his future prospect. “This is about the time that I started enjoying basketball, I actually felt that I was good enough to play,” Hans said. Entering high school at Glencoe, the coach moved him up to play JV basketball as a freshman. Hans was contributing enough on the basketball court that he attracted attention from many coaches in the area. In 1995, his sophomore year, he transferred to Central Catholic High School in Portland, Oregon. Central Catholic had become the state champions the previous year and with Hans added to the roster ... the future could only be brighter. Hans also grew more to reach a height of 6’ 9”. During high school, Hans played on several AAU elite traveling teams during the summers. He played with a Glencoe tourney team and SEI (Self Enhancement Inner City) from Portland. Hans played with Freddie Jones (became the NBA Slam Dunk Champion). The strongest team he played on was called Triple Threat. This team had players that went on to play in major colleges and in the NBA. Coming in as an outsider to a Catholic school was very challenging. He was not of that faith and blending in was a little tough. Hans was doing well despite the major adjustments – he was one of the starters on the basketball team and a contributor. The summer before his senior year he was playing in a Las Vegas tournament with Triple Threat. This team was filled with amazing talent. There were many college scouts at this tournament. Hans played one of his best games in this tournament – 16 points, 10 rebounds, 5 assists, and 4 blocks. “For some reason I always played better during the spring and summer. There were Division I college recruiters from everywhere. I always felt that my defense was the strong point of my game. Defenders don’t always get the glory, but players that score always get the attention,” Hans said. With his performance in that game and the coaches recognizing his tall frame and defense abilities – timing couldn’t have been better. He caught the attention of many including John MacLeod, head coach of the University of Notre Dame. Assistant Coach Parker Laketa was wowed even more. “I started getting calls from many coaches after that game. As this was happening I thought about how I had been inspired more. I was watching colleges like Duke with Bobby Hurley and Christian Laettner. Unfortunately Duke wasn’t one of the colleges after me,” Hans said. That afternoon, Hans got a call from John MacLeod offering him a $100,000.00 scholarship to play basketball for the Notre Dame Irish. They were inviting him to come for a recruiting trip. Later that summer Hans went on three recruiting trips. In the spring he signed to play basketball at Notre Dame. After talking to his dad they decided it would be best for the education and job opportunities afterward. Hans was highly recruited that year. All of the PAC 10 (now PAC12) schools, St. Josephs, Santa Clara, Utah, Pepperdine, Annapolis, and many more were interested. He was selected to the Coca-Cola All-American Team and was recognized in the Street and Smith’s Magazine. He played a lot of basketball all through the summer and in the fall. In 1997 during his senior year something terrible happened, he went down with a stress fracture to his right ankle below the tibia. “I was really depressed – in tears for a long time. One of my friends came over and we just cried for a long time. Your senior year is the best part – a dream to make it to state,” Hans said. Luckily Hans had already signed with Notre Dame. His parents encouraged him to put high school aside and focus on college. Larry and Penny were struggling a bit with jobs because of the economy. Money for them was a little tight at the time, but they still managed. His mom, Penny, had taken on an extra part-time job selling china sets to pay for the private school tuition. “Mom was great – positive. She always made us believe we could do anything we wanted. I get a lot of my personality from her. I could talk to her about many things – she was encouraging. My dad was kind of quiet, but a hard worker. He was harsh at times and seemed to only want to talk about politics or business. I think because of that it created a strain in our relationship. He came from a broken home and compared to that he did a great job being a dad. Our relationship recently has improved,” Hans said. Hans acknowledges all the things his parents have done for him, the tournaments they paid for – traveling can be a huge expense. The basketball shorts, shoes, etc. He is very grateful for all of the love they showed him. It was at Notre Dame that Hans met his wife, Kelly. They were taking the same accounting class and the teacher had paired them up to be partners in a school project. They got to talking and found out they were both from Oregon. “Kelly was from Salem and I was from Portland. We were sitting together and we started making sarcastic remarks to each other. She was beautiful and smart – we hit it off and became good friends,” Hans said. Hans had played basketball at Notre Dame for one and a half years thus far. He was a young man that had a problem with authority. He handled a situation in a way that he’d probably do it different if he went back. He remembers playing his worst game at the nationally-televised Alaskan Shootout (a well-known college tournament). He rolled the basketball over his foot and it flew out of bounds. On defense he was guarding Elton Brand (now in the NBA) – Kelly was watching the game. After the tournament a big meeting was held at the Notre Dame campus. The boosters, the priests, the coaches, and other important administrators were present. The assistant coach stood up in front of everyone and made some remarks about Hans’ terrible performance. He didn’t know why they had recruited him – it might have been a mistake. “I was really upset after that incident, and I should have handled that differently. It shouldn’t have been about the coaches and what they said, it should’ve been about how I played and how I could improve. I was hurt pretty bad and I didn’t want to play at Notre Dame anymore. I approached the head coach and explained why I was leaving – he was very professional about it,” Hans said. Hans was really depressed and he began drinking and partying, he felt really low and was empty inside. He even thought about committing suicide several times – one of the worst moments of his life. “I had just met Kelly too. The change was from private jets, steak dinners, signing autographs, and massive attention to working at a mill for my dad. I was not walking with the Lord at that time,” Hans said. Colleges found out he left Notre Dame and the recruiting began again. University of Oregon was after him. Head Coach Ernie Kent was working out a deal with Hans, but things didn’t pan out. He ended up signing with the University of Portland. Rob Chavez was excited about a 6’10” center coming to play for him. Kelly was working on a Y2K project in Salem during that time. One day at work, she passed out – fell on the floor. She was rushed to the hospital and it was discovered that she had a softball-size tumor wrapped around her heart. Kelly was diagnosed with Hodgkin’s Disease. “This was a tough time in our life and I wanted to be with Kelly, but the coaching staff was not supportive – I told them all to go jump in a lake. I went to be with Kelly and I supported her through all of the chemotherapy treatments,” Hans said. It was a rough six months for Hans and Kelly but they made it through, Kelly had recovered from all of her treatments. Notre Dame had a different coaching staff and Hans made a connection with Matt Daugherty. He welcomed Hans to come back and play at Notre Dame. “Kelly and I went back to Notre Dame – I wanted to finish what I started there. My senior year, Head Coach Mike Brey was awesome – we made it to the second round of the NCAA Tournament. I graduated with a 3.2 GPA and Kelly graduated with high honors. I was very lucky to have had the opportunity to play at Norte Dame,” Hans said. Hans married Kelly in 2002. They were starting a life together. A little later another downfall came. Kelly was diagnosed with cervical cancer due to the chemotherapy she had received previously – another battle for her to fight. She underwent chemotherapy once again to treat this cancer and she eventually recovered. After college, Hans played with the Portland Trailblazers during the summer – a Pro-Am Team to develop for a possible shot at the NBA. He played with players like Damon Stoudamire and Rasheed Wallace. He was also in Pro Camps including working out with 6’ 11” Jermaine O’Neal. “It made me feel good when I was playing defense on Jermaine O’Neal. The coaches were telling Jermaine that they should have picked me. It was summer and I always played better in the summer,” Hans said with a smile. Hans experienced what many athletes only dream. He eventually went on to play in Bergen, Norway, in a professional basketball league – he signed a contract. What started out being great ended up being a disappointment. The coach’s language, temper, and expectations were beyond measure. This was not a situation that Hans wanted. “I had a meeting with the coach and told him that he needed to change the way he treated his players and his negative attitude or I was leaving,” Hans said. On September 11, 2001 Hans worked out a deal with the team to avoid getting sued for breaking his contract. He would pay for his own flight back home using a credit card. The only problem was that all of the flights had been cancelled because of the New York World Trade Center being attacked by terrorists. “The coach let me and one other player (with the same idea) stay in his attic until the flights resumed. I lost three nights of sleep and I was very depressed. I had a study Bible that my sister had given me – I started reading it. We started talking about the Lord. It was there that I felt an extreme calling to follow the Lord. If I would have continued with basketball I’m confident I would have been a good off-the-bench player in the NBA. At this point I was done with basketball,” Hans said. When Hans flew back to the USA, he started working in a construction job in Tacoma. Kelly was working at Legacy Hospital in Portland. Hans had previous schooling at college in the IT (Information Technology) field. Kelly helped get him a job at Legacy. They got married in 2002 and financially they were doing extremely well. Hans had moved up the ladder rapidly – he had become an IT Manager in a short time. Hans enrolled in a seminary to study the Word of God. He was getting an education to someday become a pastor. Their wish was to have a family but because of DNA issues and blood issues they would lose 7 babies to miscarriages. “I think that having kids started being like an idol to us, we wanted that so bad. When we realized that, we decided to adopt a child from Ethiopia. Before we started the process we found out Kelly was pregnant with the twins, John and Jaden,” Hans said. After John and Jaden were born, the miscarriages continued to 3 more – a total of 10. Hans and Kelly were attending Athey Creek Fellowship, a church in Wilsonville, Oregon. It’s there that Hans learned so much. He speaks highly of Brett Meador, the pastor at Athey Creek. Hans realizes now that God was training him to become a pastor of a church. He was involved in kids’ ministry, nursery, kids’ camps, sound, setup and tear down. You name it and Hans did it passionately. "We started praying for me to become a pastor somewhere. Shortly after that, Brian Lindon, who is from the Salem/Keizer area, called Athey Creek Fellowship. He said that he couldn’t find a church that taught in the style that Athey Creek did. He was wondering if they could send someone to start a Bible study in Salem,” Hans said. In March of 2011, Hans came to Keizer, Oregon, and started a Bible study at Brian’s house. Each week more people started showing up. They moved the bible study to a room at the Keizer Civic Center. Mission Fellowship was planted and it began meeting at Keizer Elementary School. Mission Fellowship has grown to 300 people who now meet at Straub Middle School in West Salem – located on a hill overseeing a beautiful view. Hans and Kelly left their high-paying jobs, friends, and upscale lifestyle all behind to follow the Lord and do his will. “It was a very tough thing to do. Our salary was four times more. The Lord has done an amazing thing starting this new church,” Hans said. Being a pastor has challenges. Society doesn’t like to hear what the Bible has to say. Pastor Hans has offended people because of this. Sometimes it’s difficult to teach the Lord’s Word. Hans messes up at times – he can be too hard or too soft getting the message across. He’s still working at finding a balance. “Being a pastor is an amazing job, but a hard one at the same time. It’s like being a dad to 150 people – when their hearts break my heart breaks – when they rejoice I rejoice. I sit quiet when people make unwise decisions and I just have to let them. I’ve learned that my job is not to be a pastor but to love people. Not just teaching, administration, counseling, and all the rest, but loving them as if they were my own kids,” Hans said. It’s a difficult thing, taking on everyone’s stuff – abuses, addictions, sleepless nights. There are a lot of tears in this job. Hans prays for people regularly. All of that stays with him when he’s at home with his family. Hans has led Mission Fellowship in the Lords work. They have an ongoing project with the DHS (Dept. of Human Services) visitation rooms – remodeling and painting them for the foster kids waiting to be placed in Marion County. Mission is active in Young Life and Wild Life (Jr. High Kids) programs. Internationally, members of the church sponsor 12 kids in Africa through Compassion International. In Burkina Faso, Africa, Mission supplies building materials for church roofs, food, and pastor teachings of the Bible verse by verse. Hans has close ties with Marcel Yonogo who is the leader building churches and spreading Jesus’ word throughout Africa. “My goal in life is to first know my Savior as well as I can. At the end of the day I’d like to stand in front of the Lord and say that I have done His will as a pastor, dad, and a husband – sometimes I feel I don’t do a very good job at that. I want to have faith in teaching the Lord’s Word faithfully,” Hans said. Hans, What kind of things have you done for your community? I haven’t done much, but I think the Lord has done a lot. I try to empower people to use their gifts that the Lord has given them. If I can do that, I will consider myself a good leader. A good example is the Withams, Shane and Malia. They have taken on a huge task in partnering up with DHS and loving on foster care kids, and our church supports them. Will your kids play sports? My kids love playing sports, I think they will always play. It will be up to them if they want to play organized sports. I will support them no matter what, but they have to understand what the important things are in life. The Lord comes first and family comes second. Sports can also be good for ministry. I don’t consider success money, a job, house, the number of kids, or any of those kinds of things. A person who can weather the storms of life with joy and good temperance, that’s a person who has been raised successfully or who has been encouraged successfully – that’s what I want for Kelly and my kids, I love them. Duke – I was inspired by some of the players and their program. If they would have offered me something I would have accepted. Celtics, I’ve always liked them. I enjoyed watching Larry Bird, Dennis Johnson, Kevin McHale, and Robert Parish. I enjoy Red, Josh Garrels, Josh White, and Rend Collective. I like Hoosiers, The Right Stuff, and Black Hawk Down. Iyana Irving shattered the women’s pole vault record at the 6A Central Valley Conference District Championships in Salem, Oregon. As a junior in high school she cleared 11’ 2”. Just imagine the height of a ten-foot basketball rim and add another foot plus two inches to that. The pole vault is an event which a person uses a flexible pole made out of fiberglass or carbon fiber. It has been an event at the Olympic Games for men since 1896. For the women, it has been an event since 2000. The women have taken this event to a higher level. Not many athletes have the courage to try this event – it takes a certain kind of person. The technique is one you just don’t learn overnight. The steps used during the approach are crucial. The plant on the box and the takeoff must be of perfect timing. The swing up and the extension must be done in one motion controlling the body as it prepares to turn. The turn and fly-away are the final two motions that could mean clearing the bar. Iyana is the daughter of Troy and Loretta Irving. She has an older sister, Ayla, and a younger brother, Gavin. She was raised in a middle-income-class neighborhood – a pretty normal environment. She had friends in the neighborhood throughout the elementary and middle school days, but as they got older some moved away and others went their separate ways in the local area. “My family has always been close and open. I always felt trusted and loved,” Iyana said. Iyana attended Brush College Elementary School and Walker Middle School. She has always been a little shy when first meeting someone, but once she got to know the person she was very friendly. Her peers know her as a friendly and an outgoing athlete. I had a chance to talk to Iyana’s elementary P.E. teacher from Brush College Elementary. “I remember Iyana being a hard-working girl and always having a positive attitude. She was great, and her main focus at the time was soccer. She had a great work ethic – setting goals and achieving them. I would have never guessed she would be doing the pole vault event – that’s great!” Loni Espinoza said. Iyana herself admits that soccer was her main sport and she still enjoys playing soccer. In middle school she participated in track and field – the hurdles and the high jump. She seemed to like getting up in the air – it was exciting for her. Eric Herber, a high school teacher at West Salem High School, approached her and suggested she try doing the pole vault when she got to high school. He seemed to think she had the speed and at the time she was small – a perfect fit for pole vault. “When I got to West Salem High School I decided to try the pole vault. I discovered that I really liked it. There’s something about being up in the air – it’s a rush. I enjoy it every time I plant the pole in the box and fly over the bar,” Iyana said. She’s never really had any serious challenges in life, but it was always difficult for her to choose a sport to do or what events to do. Right now she plays soccer, which has always been her passion – she even plays club soccer. Her improvements in the pole vault from her freshman year to her junior have been so impressive that she is starting to lean toward track and field. Iyana’s best friend is her cat “Sassy”. She really enjoys her Siamese pet and keeps very close to the furry friend. She also has a boyfriend, Spencer, who is someone she can talk to about anything – they’ve been friends for a very long time. Two girls she’s very close to as well are Haley Houston and Sara Morschack – she grew up with them and sees them pretty much every day. “I love hanging out with my friends, I feel I can be myself and also talk to them about anything,” Iyana said. Iyana is an original name – there isn’t anyone I know that has that name. “My mom was going to name me Isabel. Then she changed it to Ayana. She wanted people to be able to sound out the “I”, so she changed it to Iyana, which also gave my name uniqueness,” Iyana said. Iyana’s parents have been very supportive in her sports adventures. Her mom would take her to practices, games, track meets, etc. She speaks highly of her parents and is so thankful for the opportunities and foundation they’ve laid for her. “My mom is the best – she is the one that takes me everywhere. All my games, track meets, etc. She’s an amazing mom – so thankful to her, we’re like best friends,” Iyana said. Iyana does heart-touching things for others. One time she was helping at a basketball camp. This camp was for youth girls. There was a little girl that was very shy and it seemed that she didn’t really want to be there. She was afraid and a little lost. Iyana made a decision to hang out with her the entire time to help her feel comfortable. The little girl started smiling and felt more comfortable knowing she had someone like Iyana to hang out with and guide her. “I just wanted her to feel comfortable being who she was and not for her to pay attention to what others thought. I wanted her to have a fun experience instead of being frightful,” Iyana said. The pole vault event requires great upper body strength. Iyana has been enrolled in a weight training class since her freshman year. She started working on her speed and building a higher level of stamina. This young lady knew what she needed to work on. “I try to work on my abs, and upper body strength – core strength is really important. I also do squats which helps me in soccer. This has been great for the pole vault event too,” Iyana said. By her junior year, Iyana was excelling in track and field. She was becoming one of the best in the Central Valley Conference and in the state. The conference consists of six high schools, McKay, Sprague, North Salem, South Salem, McNary, and West Salem. “I just kept thinking to myself what it would feel like to be at the top of that awards stand. Several weeks before the district meet that kept going through my head,” Iyana said. One week before the district championships, Iyana was practicing. She normally takes 6 steps before planting but recently increased to 7 steps (only one foot is counted so 14 steps). As she planted, the fiberglass pole bent and she used her arm strength to push herself up before turning in the air. Something went wrong and she came straight down with her head landing next to the box. Iyana was hurt, but because of the padding around the box she survived the fall. Some athletes might not want to continue this dangerous event after a fall like that, but not Iyana. With only a week left before the district championships, she collected herself and got back on the horse. “I learned as a little girl to get back up if I took a fall, so naturally I wasn’t going to let that fall keep me from competing at district. I got back up on my feet and tried it again,” Iyana said. It was a beautiful day on Wednesday, May 14, 2014. The women’s pole vault competition got under way. Iyana was ready and hungry to complete the journey traveled since her freshman year. When the pole vault event came to an end, a district record had been broken. Iyana cleared 11’ 2” to prevail over the entire conference. She had set a record and put herself at a second-place ranking in the state of Oregon. She qualified to compete at the state meet for the first time. “I was so happy and excited, not only for myself, but for my parents too – I got to see how proud they were. My mom was so happy that she started crying – that really touched me. I was standing at the top of the award stand, I can’t describe the feeling. It felt so good – it definitely put a smile on my face,” Iyana said. She had a week to prepare before heading to Eugene, Oregon. Some of her teammates qualified as well. The 6A OSAA State Track and Field Championships would take place at Hayward Field – Track Town USA. On Friday May 23, Iyana performed at Hayward Field in front of thousands of people. She did a great job and placed very high. Laura Taylor won with a clearance of 12’ 8”, Tory Edwards placed second at 11’ 3”, Marissa Taylor received third at 11’ 3”, and Iyana Irving placed fourth with a clearance of 10’ 6”. Two of the girls are seniors which gives Iyana a good shot at winning next year. “The experience was more than I could ask for. I couldn’t believe that I was actually there! I knew that I had to treat this meet like a normal one. Thanks to this year’s events I’m already looking forward to competing next year – I can’t wait to compete again I want to win it next year,” Iyana said. Iyana plans to talk to Rick Baggat, a pole vault coach for the Willamette Striders – a track club in Oregon City, Oregon. Her plans are to hopefully compete in Reno, Nevada, this summer. This young lady is not only an amazing athlete, but with a 3.2 GPA at 5’6” with a physically fit body and her charming personality, she will be competing in a pageant for the Miss Oregon Teen USA crown next November. Don’t be surprised to see her at the top of that competition – we wish her the best. “My goal is to clear twelve feet in the pole vault. If I can do that, Division I schools will look at me and possibly offer me a scholarship. I love the University of Oregon, I’m hoping to go there, but if another college offers me a better deal, that’s where I will go,” Iyana said. Iyana, what are your hobbies? I like golfing with my Dad, boating, wakeboarding, and hiking – outdoors stuff. R & B, hip-hop, and country. I study with my sister, Ayla, she is so smart. Her and my brother are both smart. Ayla doesn’t always like helping me, but she still does. Favorite athletes of all time? Never give up on anything – get back up. When people tell me I can’t do something, I work that much harder to prove them wrong. I shouldn’t be able to clear 11’ 2” in the pole vault – but I did it. I used to be weak and tiny but that didn’t stop me. Dillon James is a story which inspires many athletes struggling in today’s world. Playing basketball at McKay High School turned out to be an amazing and rewarding experience – a great decision. He’s ready to continue at the next level – Corban University. Dillon is the son of Daniel and Trudy. He has an older brother, Blake, and a younger brother, Devin. Dillon was born and raised in Sacramento, California – in the Foothill Farms District. “Growing up in Sacramento I was always an honor student, my dad always pushed me to get good grades,” Dillon said. Dillon lived in a middle-income-class neighborhood and was surrounded by friends. Everyone knew everyone. Life was good and things were very normal for him. Dillon attended Woolridge Elementary School and Foothill Farms Jr. High – both in Sacramento. It was during the grade school days that he found inspiration for the game of basketball. When he was seven years old his dad placed a basketball hoop in front of his house. He started playing with all of his friends and it seemed like he never stopped after that. “We used to play basketball in the afternoon and continue until it got dark. I want to say almost 24-7,” Dillon said. Dillon’s talent was beginning to be visible by many. He joined an AAU basketball team called the Franchise Boys in Sacramento. Another year he played with the Phenoms. The last AAU team he played for was the Yellowjackets. He was a major contributor to all of these competitive traveling teams. “Life was good, I was happy, I loved my family – especially hanging out with my brothers,” Dillon said. At the end of his eighth grade year, his mom and dad hit a major wall and began struggling with all sorts of issues. This was a difficult time in Dillon’s life, not just for him but his brothers as well. “My mom and dad went through a divorce – it tore our family apart,” Dillon said. His mom, Trudy, left Sacramento and moved in with one of Dillon’s aunts in Portland, Oregon. Dillon and Devin were with her. Blake soon followed but settled in Salem, Oregon. Dillon enrolled at David Douglas High School in Portland. His grades started dropping rapidly and he was hanging out with the wrong crowds – negative influences. “This was the most challenging time of my life. It was a huge setback. I started getting into it with my mom – we were having major struggles. I finally dropped out of high school,” Dillon said. Dillon would talk to his brothers regularly. Blake was living in Salem with his wife and daughter. It bothered Blake to see his talented brother struggling in life. He cared deeply for him and wanted the best for him. Dillon was feeling the same way – he wanted a better future for himself and he wanted to play basketball – the game he loved. “My brother and I talked on the phone a lot. He asked me to move in with him. I decided to follow his advice – he took care of me. His wife India has been like a sister-mother to me. Blake has been like a brother-father to me,” Dillon said. This task was not easy for Dillon or for Blake and his family. Dillon had to attend summer school to bring his grades up before entering his sophomore year at McKay High School. His brother was overseeing his progress in school. “Coach Dean Sanderson and Coach Matt Espinoza were eager to work with me. Those two guys helped me so much – a true blessing. They made me feel welcomed and they cared about me on and off the court,” Dillon said. Dillon started changing his life to become a better student-athlete and person. He speaks highly of his basketball team – the teammates made him feel like one of the guys. “The entire team is what I call my best friends – I don’t like singling out anyone. They were all there for me and supported me. Playing with this basketball team has kept me out of trouble and helped me overcome bad situations,” Dillon said. Dillon started contributing more and more to the varsity basketball team. He was getting better each year. His brother, Blake, enjoyed coming to the games. Sometimes he had to miss a few because of his job. “Coach Noza got me started on lifting weights. He helped me develop a lot of my abilities – especially in the off-season. The coaching staff has been a real blessing,” Dillon said. Head Coach Dean Sanderson and Assistant Coach Matt Espinoza have been positive role models for Dillon. “Dillon has displayed extreme growth in multiple areas of his life since his sophomore year. His story should be an inspiration to young athletes. If he continues to create positive habits, he will have a great career at Corban,” Coach Espinoza said. During the final basketball season, Dillon started talking to players on the team that looked a little down. He had been in those situations and didn’t like his friends feeling depressed. He found a way to counsel them and to give them support in whatever they were going through – he could relate to similar situations. By his senior year, Dillon had brought up his GPA to a 3.2 and led his team to the second round of the state playoffs. He averaged 18 points 8 rebounds per game and was selected to the First-Team CVC (Central Valley Conference) – a two-time first-team selection, his junior year and senior year. His mom, Trudy, attended a lot of his games – you could hear her cheering loud – sometimes even at the refs. She is working at patching up the relationship between her and Dillon. She wants to be closer to her son as time goes by – cares deeply for him. There were several colleges very interested in Dillon, but the college he felt most comfortable with, was Corban University. “The coaches at Corban invited me to their open gym to play with the college players. Coach Masten believes I can be one of his best players in the near future,” Dillon said. Head Coach Steve Masten remembered Dillon when he was a sophomore in high school. At that time Steve was doing some broadcasting for CCTV – a local TV station. “When I watched him play I noticed how good of a player he was and how much potential he had,” Steve said. The coaches from Corban attended a few of Dillon’s games his senior year. When McKay played North Salem you could see them sitting on the front row talking to each other. Dillon thought they might be scouting Malik Leaks – a talented player from North. “He was definitely on our list all season long. We got a chance to talk to Dean Sanderson. We really liked the things we heard,” Steve said. Dillon has put himself in a position to continue his education and to play college basketball locally. His family will enjoy watching him play. He has worked hard in his studies bringing his GPA up to a cumulative 3.2 – in summer school he carried a 4.0 GPA. “He’s worked very hard to get to where he is now. We like that about him. We also like the student aspect of our selection. Dillon is a great student. We were definitely attracted to him – we’re really excited about having him join our basketball team,” Steve said. Dillon didn’t sit around after his basketball season was over – he went after it – made some visits to the Corban University basketball court. “We had him come out and play at some of our open gyms at the college. He gave one hundred percent and played great! I actually feel bad saying this, but he played better with our college players than with the high school players,” Steve said. Dillon is appreciative of all the support he had. McKay was a great place for him to attend. “We realize that he had plenty of support from McKay High School, his teachers, counselors, basketball coaching staff, and his friends,” Steve said. Corban University which was formerly known as Western Baptist, has recruited some talented athletes in the past. Players like Brian Hills who holds several records and Jordan Carter who will be a senior at Corban next year. Dillon will continue the talent pattern in the local area. Steve talks about how he likes looking for local talent in the area. “We are planning on redshirting him the first year. We’ll refine all of his offensive and defensive skills. He needs to get stronger physically. He’ll have a chance to learn how our basketball program works – not just offensives and defenses, but the college setting as well,” Steve said. Coach Masten already has ideas floating through his head. He has a plan for Dillon – one that will benefit him and help the Warriors in the near future. “We plan on him playing the 3 position or possibly the 2 position on offense. At 6’4” he’ll fit right into our system,” Steve said. Coach Masten is exciting about bringing Dillon James into his basketball program. He cares about Dillon not only as a basketball player, but as an individual. He wants the best for Dillon – for him to continue becoming a fine young man on and off the court. “Well, it’s the tip of the iceberg. Dillon has a chance to do some great things in the future. I feel like we won the lottery. There were several colleges interested in Dillon, but he chose us – we’re very excited,” Steve said. A formal signing was held at McKay for Dillon. Corban Head Coach Steve Masten, Asst. Coach Drew Ross, and Asst. Coach Dan Hiebenthal were all there. McKay Coach Dean Sanderson was standing next to them.A large group of Dillon’s friends and teammates were there to support him. Dillon’s mom and brothers attended the event with smiles. Dillon recently made contact with his dad and is working at establishing a relationship with him again. “I’m so proud of Dillon – I plan to move to Salem so I can watch all of his games. I feel excited and happy,” Trudy said. His brother Blake has been such a positive influence. “Oh man, what can I say? I’m so proud of Dillon. Moving on and playing college basketball. I’ve always wanted the best for him – now it’s happening,” Blake said. Dillon stood up and thanked all of the people that showed up for his signing. He expressed that he couldn’t have done it without the help of many. He included his teammates, the teachers, the coaches, and his brother, Blake, and sister-in-law, India. He likes technology – possibly electrical engineering – the computer science field. Dillon is still undecided of what career he wants to follow – he’ll be exploring. Dillon, what kind of advice can you give young athletes out there? Never give up. Everyone has their trying moments. You have to believe in God – he will help you. He’s blessed me with a full scholarship to play basketball for Corban University. When I was in middle school I hit a half-court shot right before halftime. In my senior year, watching my friend, Jacob Brustad, hit a buzzer shot to beat McNary. I also scored 31 point against Franklin. Oklahoma City Thunder – I keep up with Kevin Durant. A story no one knows about you? When I was five years old I once cut my hand in half on a barbed-wire fence. I almost lost one of my fingers. Glad it wasn’t my shooting hand – haha! A down-to-earth country girl, who struggled as a young kid, not only with her confidence, but with her athletic abilities, has put herself in a position to play college basketball for the Pacific University Boxers. Averaging 12 points and 4 rebounds, she was selected to the second team Mid-Willamette Conference her junior and senior years. She was also voted Most Valuable Player of her basketball team. Meagan Ratliff was born in Silverton, Oregon, and raised on a farm riding horses and listening to country music. She’s the daughter of Jerry and Tonya. She has a younger sister, Mackenzie, and a younger brother, Austin. “When I was little I wasn’t very good at basketball – I actually didn’t like it. All my friends started playing the game and I just followed along – I guess I just went with the flow. I didn’t have confidence and was unsure of my abilities,” Meagan said. Confidence has always been an obstacle for Meagan. As a little girl she attended grade school and middle school at Mt. Angel, Oregon, a very small town not far from her home. She was on the quiet side among her peers. Playing basketball in her early years for the Boys and Girls Club and YMCA leagues, she found herself being left behind – all her friends kept improving. “I’ve always been the type of person that was very competitive at everything I did. I wanted to be good at whatever I did. In basketball, everyone was getting better and I wasn’t improving,” Meagan said. Her dad started coaching her and her mom was a strong supporter watching from the bleachers. Her younger sister and little brother started playing basketball as well. While Meagan was struggling on the basketball court during her fourth-grade year, her dad, Jerry, was diagnosed with kidney failure. Things only got worse for Meagan and her family. This young lady is a believer in Jesus Christ – I have no doubt that her faith guided her through this. Her dad received an amazing gift from his Aunt Sandy. She donated one of her kidneys. Jerry recovered from this and is doing well. “After that experience, our whole family made a decision to find something that we could do together to bond more. We became closer and decided that since we all enjoyed basketball, why not make that activity something we can all do together? So we became a basketball family,” Meagan smiles. As the years went by, Meagan was improving slowly and she started liking basketball more – but still lacked in several skill sets. She played for the Future Foxes, who competed against local teams. She was playing with a group of girls that played together for years. She says that living in a small town you benefit by playing with the same group – you just know each other well. Her dad wanted to help his daughter improve her skills. He started looking for a basketball trainer. It was during Meagan’s seventh grade year that her dad discovered a basketball trainer, Coach Matt Espinoza … www.dynamicpd.net … Every Sunday Matt would work with Meagan – her ball handling skills, shooting form, positioning, and footing. Her “confidence” improved drastically and so did the rest of her skills. To this day she continues to work with Matt (Coach Noza). Her work ethic is very strong and she always gives 100% at every drill. “Meagan has improved tremendously in the six years I’ve known her. What’s remarkable about her is that she is not only driven on the basketball court, but also in every aspect of her life. There’s no doubt in my mind that she will go on to have a great career at Pacific,” Coach Noza said. Meagan entered Silverton High School and became a member of the Lady Foxes. Her high school basketball career was a great experience. During her early years the team would lose many games. Her last two years of high school she helped turn that around – they started winning more games. By her senior year they made it to the second round of the state playoffs – an amazing improvement by the entire team. Her junior year she attended the Pro-Classic Willamette Basketball Camp in Salem, Oregon, and the NBC Camps in LaGrande, Oregon. She was recruited to play with the Oregon Elite – a traveling tournament team that competes all over the nation from April through July every year. “Oregon Elite was such a great experience for me. I made new friends that liked basketball just like I did. My independence grew a ton – I had the opportunity to see other cities in the U.S.A. It was fun fitting in with a group of talented girls. We still keep in touch,” Meagan said. Meagan is a 5’9” senior wing who wore #33 during the basketball season. She had great teammates like, Alia Parsons and Lilly Paradise, who were major contributors in leading the Silverton Lady Foxes to the second round of the state playoffs this past season. Not only has Meagan found success on the basketball court, but her academic world has bloomed to a GPA of 3.98 – including being selected the Salutatorian of her senior class. Taking four AP Classes her senior year clinches her total package earned. One day she received an email from Pacific University which resides in Forrest Grove, Oregon. The coaches were interested in her and asked if she would like to visit the college. All that Meagan had gone through, not only with her dad’s medical situation, but her sweat and perseverance for years had paid off – a joyful moment couldn’t have come at a better time for her. “When I visited the college the first time, I met the coaches and fell in love with their program. We kept in contact and eventually I drove up a second time for another visit. I informed them that I’d like to play there. They took me into the gym where I met one of my teammates. It was an incredible day!” Meagan said with a big smile. Basketball has helped Meagan in so many areas of her life. It has helped her focus better on her family. She supports her siblings as they support her. The sport has helped her develop a stronger work ethic and the process of how to reach a goal. She learned how to manage her time and prioritize – and how to lose a game and be a good sport. It’s not easy she says, but well worth the effort in the end. “Basketball is about having fun, and that’s what I’m doing. I love the sport and it gives me a chance to fit in with a dynamic group of girls. I know some of the girls already – I’m excited to attend Pacific next fall,” Meagan said. One thing that people might not know about Meagan is that she has done nice things for people. She was with a group of friends in a restaurant in Silverton. They paid for a family’s meal. Then all of a sudden, the person behind them paid for theirs, and then the next person paid that person’s meal. It continued the entire day! Wow! The love that her mom and dad have given her has been passed on. I’m sure that she is so proud of her parents, all the support they gave her – being there for her and her siblings. I commend parents like that – they put their kids first and look out for what’s best. Well done Ratliff family, keep up the good work. Meagan’s positive attitude points at success. I wish her the best at the next level. Meagan, what are your favorite subjects in school? I like Anatomy, Biology, and Chemistry. I enjoy baking, the beach, hiking, shopping, movies, and listening to country music. Favorite NBA team, college team? I love the Blazers and UConn. What advice can you give to a young athlete? Be confident in yourself and work hard. Always remember to have fun with it. Romans 8:1. There is therefore now no condemnation for those who are in Christ Jesus. If I wouldn’t have married my wife, I would have no clue of what it takes for an elementary P.E. teacher to do an “excellent” job. Trust me, I’m not being biased. Loni Espinoza, who happens to be my wife, teaches at Brush College Elementary in Salem, Oregon – she’s always thinking of the kids first. Loni has two daughters, Kalin (her husband Everett) and Darci (her husband Gino), and two stepsons, Jake (his wife Jennifer) and Matt. She loves all her grandkids, Silas, Luca, Tyson, and Josiah. She is all about health and fitness in a fun way for kids. Child obesity is at its highest – an alarming rate. CDC (Center of Disease Control) states that 32% of American kids are overweight and 17% of ages 2 – 19 are obese. Many kids are spending less time exercising and more time watching TV, playing video games, and iPhone use. Exercising is so important to our bodies and it should start at an early age. Loni wants to help as many kids as she can. She introduces sports and active games that keep the children engaged and participating in a fun way. She implements P.E. programs that can help kids presently and in the future. On an average day, Loni is up early every morning – I’d say about 5:15 a.m. She reads the newspaper and usually works on school paperwork that she could not complete at school – there isn’t enough time with a full schedule. Batches of kids come into her gym one right after the other. Loni spends extra hours at home planning her activities for all her classes. I see her every night working hard on school projects. Every kid is important to her – that extra time planning is crucial. She wants every kid to participate and not to just stand there watching others. “It doesn’t make sense to me for a line of kids to be there standing and watching the others. So I organized my activities to never have more than a few students in line,” Loni said. It’s not just her required work she plans for, but also extra activities outside of school that kids love. For example, the Elks Hoop Shoot competition. This is a competition where she invites every kid in the school to participate. Each student shoots fifteen free throws. There are several age-groups – the top person from each age-group qualifies to advance to the district level. At the district level they shoot 25 free throws. The Punt Pass and Kick Contest is a well-known competition. Loni organizes volunteers to help spot where the football lands after each kid passes, kicks, or punts the football. Tryouts are held and she coordinates the entire process. Once she determines the winners she records the names, distances, etc. to the NFL committee and deals with any changes. Filling out paperwork and entering data into the NFL website is also another task she completes on her own time. Country Kids Relays (formerly known as Jaycee Relays) is another activity that is not required by the school. She spends extra time to provide each kid with an opportunity to experience such an amazing event. She holds time trials for the 100 meters – logging each kid’s time. At Brush College Elementary the track is only long enough for 80 meters. She gives each kid an opportunity to prove they are the fastest. Each grade will have a 100 meter relay team for boys, girls, and coed. In addition, there is a race called “The Mayor’s Mile” which is a 1500 meter relay – fourth and fifth graders can try out for this by her standards. On the day of the kids’ relay event Loni is up very early to drive down to McCulloch Stadium at Willamette University – to set up her school tent in the middle of the field. She normally packs everything in her car the night before. All of the teams from every grade and parent helpers show up on their scheduled time. Loni is there the entire time from morning to evening. She takes pictures and instructs the volunteers. She also times the races and makes it a point to tell each kid how much they improved. When she returns home it’s usually about 7:00 p.m. – she is exhausted. Loni sees how much the kids enjoy this event – the time put in for her is worth all the effort. What the parents see is their kids racing that day, but really have no clue of the work it takes to make that event happen. I’m grateful not just for Loni’s work, but all of the other P.E. teachers that are doing the same thing – on their own weekend time! That is very generous. There are more activities and events throughout the school year – the ones I mentioned are just a few. The biggest activity she coordinates and teaches is her “Bouncers” jump rope club. They meet every Thursday after school for practice – which makes it a long day for her after taking care of the equipment and cleaning up. Performances at basketball-game halftimes are regular events every year. She also takes the kids on field trips during the spring so they can perform jump-rope shows. Loni makes it a fun event for all of them. One time we were at the store shopping for groceries. “Loni, why are you filling up all those bags with different candies?” I asked. “My jump rope club voted on an ice cream sundae to celebrate at our end-of-the-year party, and they voted for these toppings,” Loni said. She goes out of the way to think about them and what makes them happy. She gives out prizes for certain things in her class. She takes time on weekends to pick out toys that the students will enjoy. Every year she organizes a fifth-grade bowling trip. The top bowler gets a customized bowling pin. Again, not required by the school, but she knows the kids love that. I’m lucky to be her husband, I get to hear about all the good things she does for kids. And now that I’m retired I get to help her with these kids – that’s totally awesome. Loni has what she calls “Units”. One unit could be teaching kids about basketball. Another unit might be teaching kids about volleyball. Whatever unit she is teaching that week, she takes it seriously and is very organized. Along with that she deals with discipline issues, injuries, parent complaints, etc. Every teacher has a planning time. Loni has to crunch her planning time with referral notices or a kid that might have missed a time trial, or a fitness test, etc. Her day is non-stop – very busy. One of the things that really touched my heart was how she figures out a way for every kid to participate. She gets kids that are handicapped from time to time – every year is different. How can you give a kid in a wheelchair the opportunity to exercise? How can you give a kid that has one arm a chance to compete? She thinks until she finds a way. She once had a student that had one arm. He wanted to join the jump rope club. Loni found a way. She tied the rope in a way that he could use the one arm to swing the rope and jump over it. Loni coordinates a “Jump Rope for Heart” day. Stations are set up for the kids to jump rope during P.E. class that day. She brings the apple juice and oranges early in the morning – slices the oranges up for the kids to eat. This fund-raiser event brings in thousands for the American Heart Association. At the end of a school year she coordinates an enormous field day for the kids. She makes tons of phone calls to ask for volunteer help. She prepares all of the necessary equipment for games and other activities. This year she is having me build her a “Splash Wall” for field day – a new game the kids will really enjoy. She’s always looking for new games that the kids might have fun with. Throughout the school year Loni takes many pictures of students and staff. There is a reason for this. Toward the end of the school year she slowly is working on a slide show. This slide show is so special to the entire school – it is shown on the last day of school in the gym. She picks the music to fit what appears on the screen. Loni makes it a point to have every kid and staff member in the slide show. “When the kids watch this slide show and they see their picture come up, they just go crazy! There are some goofy pictures and some serious pictures – I try to make it fun for everyone,” Loni said. I have to say that I’m so proud to be her husband and even more proud of her – really love her. I know she has a passion for what she does and I support her one hundred percent. Brush College Elementary is so lucky to have her there. I’ve witnessed her talking to the kids and teaching them so many things. Her compassion and selfless attitude is inspiring. She once showed me a card that one of her students gave her. I think that says it all. God Bless you Loni – you’re one of a kind. Before I fill you in on AJ Lapray, a freshman basketball player at the University of Oregon, allow me to share a few opinions about the high school state tournaments. I had the honor of attending the 6A OSAA State Tournament at the Moda Center in Portland, Oregon, on Wednesday and Thursday. On Saturday my son and I attended the 5A OSAA State Tournament at Matthew Knight Arena in Eugene. Best time of the year for us no doubt – love it! The disappointment for me was the lack of attendance. I understand that it is a financial expense, but I think that if it were my school and I had a team that made it that far, I’d do whatever I could to be there to give them support. I have asked some people, why is it we don’t see as many students at games anymore? You’d think that maybe the technology toys on the market might be a factor. Maybe there are more club sports and students will only support their sport. Schools in small towns will have more support because they have more community ties (everyone knows everyone). Those are just a few possibilities but the reality is traveling, parking, ticket price, and meals can add up to a very expensive trip. Something has to be done to fill up the coliseums and make the state tournaments an entire week of excitement … not just the championship day. If it were me, I would allow students to get into games for only $3.00 and adults $5.00 with no reserved seating. Include a discount meal during weekdays. On Saturday, okay, now you can charge $12.00 for everyone and $17.00 reserved seating. When my two boys played basketball at McNary High School I remember how the coaches (that didn’t make it to state) took their players to the state tournament one day to watch the games. One of my sons is a coach at McKay High School. He continues to take a group of boys every year. It’s a joy to give that opportunity to a kid that has never been to a place like the Moda Center. It broke my heart when he told me, I think we’re one of the last schools that still does this. I feel that coaches need to step up their game and do something for their underclassmen. It’s not a disappointment to be happy for the teams that earned that trip. Now, back to AJ Lapray, who played basketball for Sprague High School and is now on the Oregon Duck basketball team. My son, Matt aka “Noza” invited me to go with him to watch Jefferson High School play against Churchill for the championship game. I had never been to Matthew Knight Arena, so I couldn’t pass that up. He worked with AJ last summer on basketball skills and shooting. “Hey dad, do you want to watch the third-place game too? I’m working out AJ after that game,” Noza said. I said, “yeah!” I couldn’t miss an opportunity like that. I was looking forward to an adventure that most people from around here don’t get. At the beginning of the season Lapray was excited to start his career with the Oregon Ducks. In the early part of the season during practice he suffered a hip flexor injury. A group of muscles in front of the hip was the area that caused him a great deal of pain. AJ received treatment and therapy. He wanted to return to action quickly, but because he returned too soon he re-injured his hip flexor. It was very difficult for him – frustrating. He has not been able to play in any games yet. “That was a hard thing to deal with. My entire career I had never been the one to sit and just watch. I’m applying for a medical red shirt, which means I’ll be able to red shirt this year and still have four years of eligibility,” Lapray said. AJ is enjoying college and is doing very well – he has a positive outlook. He maintains a 3.5 GPA and is starting to train again. He is excited for his team, which will be heading to the NCAA Tournament. There are benefits to red shirting. You get to learn the basketball program inside and out. It puts you ahead of the game for next year. As we followed him into the Ducks’ training facilities inside Matthew Knight Arena, he gave us a little tour of the amazing place. There was an attendant watching at every hallway for security and clearance. They have a media room, film room, weight-lifting room, etc. Everything is top of the line – the most comfortable seats I’ve ever sat on. We walked into the two college-length full courts – I was in basketball heaven. AJ says that he talks to Phil Knight on occasions – they call him Uncle Phil. AJ trained with Noza. They worked on shooting drills mostly – his shooting is getting better every day. The equipment manager came in with two Gatorades and water. Whatever the players need, he’s there for them. “This is a great job – I enjoy being there for the players. There are four of us that have this job. We provide the players with any equipment they might need, shoes, uniforms, towels, drinks, etc. We have a great relationship with the players and coaches,” Patrick said. This trip to Eugene was such a joy to me. We also got to watch two exciting high school games that went down to the wire. West Albany won the third-place game against Madison. Jefferson from Portland won the championship game against Churchill. We wish AJ Lapray the best of luck and a speedy recovery from his injury. He has a promising career ahead of him. Go Ducks! I don’t want this book signing to be about me, I want it to be about you – the public. I’ve done studies on youth sports and I’ve experienced being the parent of two athletes. While the positive aspects in sports dominate the negative elements, there is a dark side to sports. In my presentation I will share with you important information that you must know. This will help you enjoy a productive adventure as a fan, parent, athlete, or coach. I’ll have refreshments available as well. After the short presentations I’ll be there with my staff until 5:30 pm to answer any questions and to sign a book (at a one-time-discount price) for you to take home. Hi, I’m the author, David Espinoza. Growing up I was a three-sport athlete – I even went on to play two years in a pro league – the NFA (Northwest Football Alliance). My major in college was computer science. I’m not a sports psychologist, but I’ve been around the sports world for roughly 47 years – give or take a few. I’ve also been a parent of two athletes that went through the entire process. Recently I’ve done some studies on youth sports today. I was a software engineer for 31 years before retiring from my day job last summer. Now I get to do what I really love. I love to write non-fiction and fiction sports stories. In 2008 my first book was published, NOZA: A True Basketball Success Story – a non-fiction book about our family – focused on my son, Matt. In this book I include a prologue on Candi, my wife at the time who died of brain cancer in 1994. I was left to raise two boys, ages 9 and 11. God and basketball helped us through. My two boys Matt (Noza) and Jake (Kid Espi) inspired me to chase a dream. I set an example for them on how to work hard at something you love. Watching their actions and how hard they worked at their passion made me feel like they returned the favor. I was motivated and never looked back. Matt Espinoza is a Southern Oregon University graduate and currently an assistant varsity coach at McKay High School in Salem, Oregon. He is an expert at several trades – a basketball trainer, Bio Signature Certified, and a USA sports performance coach. He is also the founder of Salem Hoops Project (a program that provides free basketball training to less fortunate youths) … www.dynamicpd.net … He will be a presenter on nutrition for the athlete. Matt learned during his high school days that if he was going to get anywhere as an athlete, nutrition would be a big part. I’m excited to hear his presentation. If you’ve read the Noza book, here’s your opportunity to meet Noza. In 2011 my second book was published, Poor Kid, Wealthy Kid – a sports fiction. This book is based on my experiences as a young kid and some of the challenges I faced. Moving from Texas to Oregon wasn’t easy as a sophomore in high school. This novel is driven through the sport of football. I used my imagination to create all kinds of curves including a romance between Carlos and Liz and a mystery. The diverse setting is Gervais High School where I attended my last two years of high school. I’m currently writing a sequel to this book (coming soon!). My new release is non-fiction work – The Professor – Grayson Boucher Plus More NW Sports Stories. Grayson is from Keizer, Oregon, and one of the eight stories in my new book. You will experience the lives of these athletes and their families. What obstacles did they face? How did they pursue a dream and reach it? I wanted to hear about their pain and their joy. I want to share these stories with the world. The additional and remarkable athletes in this book are Janelle Weiss, Alex Hurlburt, Avry Holmes, Brooke Chuhlantseff, Daniel Brattain, Brittney Kiser, and Noah Torres. While some of the athletes in my book will be attending the book signing, Grayson will not be there. Come meet the athletes that will be there. All of my books will be available for sale at a one-time-discount price – but you must be present for this rate. Thank you so much! If you purchase a book, you can enter to win an entire luggage set! We Hope to see you there Sunday, March 2nd, Time: 3:00-5:30pm, Place: Keizer Heritage Community Center in Keizer, Oregon. Address – 980 Chemawa Road NE, Keizer, OR 97307. If you have questions, please email me at espi42@comcast.net thanks! It’s not too often that you see a 6’ 2” point guard/wing in high school girls’ basketball. To add to this unique situation, her dad is the head coach. She has helped her team get into a position to reach the state tournament. What’s even more exciting is that her team has a legit shot at winning the whole thing this year. Katie McWilliams is a junior and plays basketball for the 8th-ranked South Salem High School Lady Saxons (Central Valley Conference) in Salem, Oregon. Watching her play you’d never guess she was 6’ 2”. The coordination is unbelievably flawless. It doesn’t matter which way she takes it strong to the basket, she’ll score with the left hand or the right hand. She has a three-point shot that has been refined to almost perfection. This young lady has worked extremely hard over the years – it’s noticeable when she plays. She’s the totally package that has major Division I colleges very interested. Nick is her dad and head coach of the Lady Saxons – Dianne is her mom. Katie has two older sisters, Alie and Lindsey. Katie has a great relationship with her family and stays close. She’s been around the game of basketball with her dad for many years. Katie was born in Hillsboro, Oregon. When she was a two year-old her family moved to the south Salem hills. Her neighborhood was pretty mellow, nothing too different. She always had friends to play with outside. Her sisters played basketball when she was four years old and her dad was coaching boys’ basketball at the time. She saw fun in the sport and her drive began. “Watching my sisters play basketball and my dad coach, I picked up a basketball one day and started dribbling – I loved it and started playing after that,” Katie said. Her dad, Nick, started showing her the fundamentals of basketball. Then at The Hoop (a basketball facility) she met Rob Jensen, a youth basketball coach. He started showing her more basketball skill sets. She was involved in basketball leagues at a very young age. “I remember signing her up for a basketball class, and then a basketball league through the Courthouse Athletic Club,” Dianne said. She attended Sumpter Elementary School and then Judson Middle School. By this time Katie had developed such an accurate shot that she signed up for the Elks Hoop Shoot Competition – a nationwide free-throw contest. In this contest you have to win at the school level, district level, state level, and the regional level before advancing to the national championships. In the second grade she made it to the regional finals. In the third, fourth, and fifth grade she advanced to nationals in Springfield, Massachusetts. Her best performance at nationals was third place. Her best score overall was 24 for 25 – this was at a competition where she needed to make 15 out of 15 in the second round to beat another girl. She had worked hard at developing a sound fundamental game for herself in all areas – not an easy thing to do and it required a lot of dedication. She earned a spot on several AAU tournament teams. During her sixth and seventh grade years she played with the Mid-Valley Monarchs and in addition to that, a South Salem traveling team. In the eighth grade Katie joined FAST – another elite tournament team that traveled. “The coaches would talk to me and tell me about their team. I wanted to get into teams that gave me more looks and better opportunities,” Katie said. This young lady has trained at 360 Shoot in Beaverton, Oregon. They have some of the best coaches teaching basketball skill sets including ball handling and shooting technique. During the summer Katie currently plays with Oregon Elite – a traveling team from the Lake Oswego area. She plays against and with some of the most talented athletes around the nation. “I’m so thankful to my parents. They provided me with transportation to and from games and practices. They come to most of my games and pay for everything. Whatever I need they are there for me,” Katie said. Basketball has been an asset for Katie. She’s found motivation to challenge herself, not just on the court but off the court as well. She’s learned about “discipline” and how to work hard to arrive at a desired objective. Social skills are so important in life and she’s definitely acquired some. “I’ve made a ton of friends because of all of the teams I’ve played on or against. We travel to so many cities to play in tournaments. Also with my team at South Salem – we are all friends and we want to reach the same goals,” Katie said. Standing pretty tall among crowds, Katie would get stared at all the time. She found it uncomfortable – you don’t see too many 6’ 2” ladies walking around. With her tall frame and nice-looking features she’s had people approach her about modeling several times. “I travel a lot for tournaments – at airports a lot of people would stare at me. It used to bother me more when I was younger, but now I’ve gotten used to it – it’s just who I am and I can’t change that. With some of my other teammates being tall it’s not as bad anymore,” Katie said. This year she’s a junior and one of the captains on her team. The Lady Saxons are stacked with great players and a great coaching staff. Katie’s high school basketball career is a positive ride that she is enjoying with her teammates. Katie acknowledges the advantages by being the coach’s daughter. She trusts him to the fullest. She can talk back to him (in a good way) where maybe with another coach she would not say anything. At home Nick and Katie think alike as far as basketball goes. She gives input to him and he listens. Their relationship is so great that it benefits the entire team as well. “I feel so comfortable talking to my dad about anything. He actually listens to what I have to say about offense or defense – and there are times when he goes with my ideas on what may work best. I know my teammates and see certain things he may not see,” Katie said. Katie is an unselfish player – she wears number 1 on her jersey and has the ability to score 30 points every game in the CVC. But she’s a team player and distributes the ball well. She has a stellar cast of teammates like #10 Jordan Woodvine, #22 Jenessa Bodine, #24 Evina Westbrook, #11 Holly Martinez Moorman, and #13 Naomi Wasser. “I think our team is goofy at times – we like to have fun, but at the same time my expectations are that we focus during practice and get motivated before each game. We compliment each other and have the same goal in mind. We even have team dinners to bond,” Katie said. This year Katie has a 3.89 GPA in the academic world. In basketball she is averaging 14 points, 7 rebounds, and 4 assists. For not playing four quarters that’s a heck of an accomplishment. South Salem girls are definitely in a different class in the CVC. Her game high this year is 24 points against McNary. Katie is a kind-hearted person. She once noticed a girl being bullied. She stood up for her – she knew that was wrong and told the other person to not do that. I think the bully, looking up at her, must have taken Katie seriously. She’s always willing to help out a teammate if they need a ride home from practices or games. Her dad, Nick, has coached basketball for 35 years. 28 years for boys and 7 years for girls. He played basketball for South Albany High School, Linn Benton C.C., and then Warner Pacific University. He has coached his daughter for many years and has instilled good values – not just on the basketball court but in life as well. The father-daughter relationship is so great that it makes it easy for him to be coaching his daughter. Before he started coaching Katie in high school, he met Brad Smith, who was coaching at Oregon City High School. Brad had a similar situation – he had a talented daughter playing for him. “I asked Brad what it was like coaching his daughter. One thing I remember him saying really sticks in my mind. He said, ‘When you drive to and from practice or games, don’t bring anything up about basketball – that’s your time to be a dad.’ He did mention to me that if she brought it up first it was okay,” Nick said. When Nick coaches he tries his best to keep the two separate – Katie is a player on the team or Katie is his daughter anywhere else. He treats her like the rest of the players. Katie respects his abilities to coach and is in full support of his coaching style. It makes it easy because of the common ideas they share – watching basketball games together and talking defenses and offenses. “It’s easy to coach a daughter that has as much talent as Katie. Sometimes there’s envy, maybe someone hears that I’m running a lot of plays for Katie. Or maybe you see a kid react in a way that she’s my daughter – that’s why I’m running that play. I’ll admit that most of our plays are designed for Katie. What people might not understand is that I do that to benefit our team – it helps our team and our goal,” Nick said. There have been times where the two haven’t agreed on something based on an offense or defense, or maybe a play. Sometimes Katie proves that her way would work better and Nick will go with it if he thinks it will help the entire team. “Sometimes I rely on her for an opinion that will help me make a good decision. This year she has had more of an impact in that area – she knows the game well,” Nick said. Nick expected to do well this year. He speaks highly of all his players. Players like sophomore Jordan Woodvine at 5’ 10” who has improved remarkably – great shooter and strong. Jenessa Bodine at 5’ 7” is another sharp shooter that has helped the team so much. Evina Westbrook at 5’10” an amazing athlete that passes the ball well – she’s only a freshman! To help the team more they have Naomi Wasser and Holly Martinez Moorman – if a team forgets about these two, they’ll knock down a three-ball. “Our goal as a team was to go undefeated in the CVC – we’ve done that. We also would love to win the CVC tournament, win two playoff games, and advance to the state tournament at the Moda Center,” Nick said. The last time Nick coached a team that won a state championship was in 1984 when he coached Santiam Christian School. Could he possibly lead the Lady Saxons to a state title this year? Time can only tell. “Katie is a dream to coach. She has such a great understanding of the game. I remember when she was a freshman. We were playing West Salem – one of the toughest teams around. She was sick that day and West’s defense was executing a box-and-one on her – traps and all. She didn’t get many shots up, but it opened up her teammates for good looks. We won the game! She was so happy – ran over to me and jumped on me! It was more important for her to win the game than to score the most points – I was so proud of her,” Nick said. Katie was busy last September, when college recruiters were allowed to talk to players. It seemed like there was a different coach at her doorstep every day. With her 6’2” frame, fundamental skills, and GPA, she has caught the attention of many Division I schools. Just to mention some … Stanford, Duke, Louisville, Nebraska, Gonzaga, and pretty much all of the PAC-12 colleges. The stack of letters continues – not bad for a junior. “I haven’t decided on anything yet but I would love to stay on the West Coast. I want to stay close to my heritage. My family is pretty important to me,” Katie said. Katie, Nick and Dianne, thank you for your time and for sharing such an amazing story. I enjoyed sitting down with all of you. I wish you the best of luck in the future. Katie, what are you favorite subjects in school? I like History and Science. I enjoy playing sports, hanging out with friends, listening to music – hip-hop, country, Christian. I like the Blazers and Thunder. In college I like UConn. What are some of your best moments? My freshman year, I had a triple-double against McKay – 12 points, 10 rebounds and 10 assists. We won a Seattle tournament playing with the Oregon Elite traveling team. I was selected MVP at the Nike Interstate Shootout after winning the tournament. I was never the one to watch the Winter Olympics – never around the snow that much. I guess it was just too cold for me. This year, I decided to watch as much as I could of the 2014 Winter Olympics. I have to admit that I have enjoyed the athleticism and dare-devil styles of these young dedicated people. Although the USA is not fairing at the top, we are still making it to the awards stand regularly and we are winning a few gold medals. I always root for my country and hope we can claim a victory. I wasn’t too disappointed that the USA didn’t win the gold in the Men’s Moguls competition – you’ll see why in a bit. The Moguls is a ski-slope event that has snow bumps all the way down (roughly a 25 to 30 second run). There are two small hills toward the end in which the competitor flips or turns in the air for points on style. This event is not just judged on speed. Alex Bilodeau was born on September 8, 1987. He stands at 5’ 8” and weighs 170 lbs. He’s a Canadian skier from Montreal, Quebec and currently resides in Rosemere, Quebec. He was the youngest athlete in history to win a World Cup Moguls event. In 2009 Alex won four straight World Cup events. Alex won the gold in this event in the 2010 Winter Olympics in Vancouver. He was looking to repeat in the 2014 winter games – training as hard as he could. As we all know in the Olympics … anything goes. Look what happened to Shaun White from the USA – the best at the half pipe in snowboarding for years. He ended up with a fourth place finish. What keeps Alex going? What motivates him and gives him the enormous amount of energy to climb to the top each time? Before we continue with his performance at the 2014 winter games, let’s take a look at his brother, Frederic. Frederic is Alex’s older brother who has cerebral palsy (CP) – a permanent non-progressive-movement disorder that causes physical disability in development. It’s not genetic or contagious. Most cases hit at the time of birth and are diagnosed at a young age. “Frederic is my inspiration. There were times when I got out of bed and it was raining – I just didn’t feel like training that day. All I had to do was look at Frederic and his unbelievable enthusiasm. That was my jumpstart – I looked forward to training after one look,” Alex said. When Alex looks at Frederic, it hurts him so much that his brother has such a passion for the sport in the snow. He realizes that his brother will never have that opportunity – it just isn’t realistic. When he competes it’s for his brother then for himself. He dedicates his wins to Frederic who is at every competition cheering like crazy. Frederic was able to travel to Sochi to watch Alex – another competition once again. In the front of the pack you could hear him cheering loud for Alex. He was so happy that Alex made it to the finals with a pretty good score – but not the top score. He had two final down-slope runs left. On his first run he faltered a little and did not get a great score – he was still holding the second-place spot. It was finally time for Alex to make his final run and a chance for the gold. Frederic was watching behind a rope (tied across to control the crowd) with his family and a pack of people. Alex took off skiing – everything was clicking his way downhill moving his skis side to side through the bumps. He came to the first hill and flipped all the way around with style. He landed nicely and continued to the next hill. In the second hill he got up in the air, flipped several times, and stuck the landing. As he crossed the finish line he yelled and raised his hands up in the air. His brother Frederic knew it was close to perfect as he also raised his hands straight up and yelled as he looked at Alex. Alex was waiting for his score at the staging area full of smiles as he looked on at the people. The score came through at 26.1 passing all competitors! He ran over to give his brother the biggest hug and held that for several seconds. You look at that scene and you see the word “subtext”. That’s right – there’s a lot of underlying history that only these two could begin to know. Alex won the gold with a score of 26.1, his teammate, Mikael Kinsbury, won the silver at 24.7, and Russian Alexander Smyshlyaev won the bronze at 24.34. “My brother is the best, he is my inspiration. I have no doubt that if he was capable he could be a three-time champion in this event,” Alex said in tears. Alex dedicated the gold medal to his brother Frederic, his best fan and motivator. We don’t need to say how much he loves his brother because he displayed it in a passionate way that most people would admire. Well done Alex, congratulations on such an amazing victory in the Olympics, not just in the sport of skiing, but in the sport of being a loving brother. Malik Leaks is a young man determined to succeed on and off the basketball court. He has become a responsible household figure while attending high school and dominating on the basketball court. Against the Crescent Valley Raiders from Corvallis, Oregon, he had a triple-double – 28 points, 11 rebounds, and 10 assists. Malik is from Salem, Oregon, and plays basketball for the North Salem Vikings in the CVC (Central Valley Conference). His parents are Lorenzo and Heather. He has two sisters – a sophomore and three-sport athlete, Simone, and a younger sister, Laila. Malik was raised in a low-to-middle-income neighborhood. He has childhood memories of getting along with all the local kids. There were kids of all ages that hung out in the area and usually there wasn’t much trouble. However, he does remember a couple of altercations that were scary. “Our block seemed to be okay, there weren’t any fights or anything, but it was weird because the next block over the police would come sometimes. I remember two times that scared me a little. Things like gang activity, theft, and other things going on,” Malik said. Malik attended Auburn Elementary School in Salem. He speaks highly of his PE teacher, Jan Florip. Kids usually remember teachers that had an impact on their lives one way or another. Malik remembers having fun during the grade-school days. “My favorite teacher at Auburn was my PE teacher, Jan Florip. She always allowed us to play fun games – kept us active. She used to put on these baseball tournaments and four-square tournaments. It was a lot of fun,” Malik said. Malik attended Houck Middle School in Salem. There were two teachers that he remembers during that time, Mr. and Mrs. Horton. Malik speaks highly of these two. They helped him with schoolwork. Anytime he had a question he could count on them for answers. If he was about to get into trouble they would have a talk with him and prevent the distraction. He’s very thankful that he had teachers like them. Kristine Horton was his social studies teacher during his eighth-grade year. I was able to catch up with her. “Sometimes I was a little hard on him and definitely had high expectations. I knew that Malik had great potential – he showed a lot of promise, not just as an athlete but also academically. I wanted him to be prepared for high school and to be successful there. I hope Malik continues to excel on and off the court,” Kristine said. Malik’s passion is on the basketball court. His dad, Lorenzo, played college basketball at OIT (Oregon Institute of Technology) in Klamath Falls, Oregon. He was a 6’2” guard that could shoot the lights out of the ball – a huge contributor to his team. “My dad took me to a basketball clinic at the Boys and Girls Club when I was in third grade. I discovered something I enjoyed doing – I loved it and have been playing the game since then,” Malik said. Malik’s dad works as a foster care provider, he also trains kids for basketball at Houck Middle School. His mom is a dental hygienist and is very supportive of the things her son enjoys doing. “My dad trained me over the years – he showed me a lot of what I know. Different basketball skill sets. Mom and Dad also put education as a priority. They actually made me read for them at times. Homework was a priority for me when I got home from school,” Malik said. Malik was blessed to have had the opportunities his mom and dad made possible. He played on some AAU tournament teams. In the eighth grade he played for ICP (Inner City Players) from Portland, a competitive tournament team. Salem Select and Salem Triple Threat were two others. The last two years he’s played for Elite 24 – a 17U spring/summer all-star traveling team from Portland. This young man has also attended national basketball camps – the Syracuse Camp, 14C Camp, Phenom150 Basketball Camp, California Bears Camp, and the Santa Barbara Camp. Malik attended the Michael Jordan Basketball Camp – when he told me this, I was so jealous … wow! In my opinion, Michael Jordan is the greatest basketball player of all time. What I didn’t tell Malik is that I had met Lebron James at the Adidas Big Time Tourney in 2003. I guess we’re kind of even. “That was such a great experience – I actually got to meet Michael Jordan. He was involved in the camp and interacted with us during the camp. Every evening he would pick one kid out of the crowd to play him one-on-one. He never lost – played to win no matter what kid was playing him,” Malik said as he chuckles. Everything was going great for Malik, the only obstacle he had faced so far was breaking his right ankle twice when he was in middle school. That was frustrating and it hurt him more not to be able to play basketball. He eventually healed and bounced back. He ran into another obstacle that was a little bit tougher on him. A year and a half ago his parents decided to separate. Lorenzo and Heather had gone their separate ways. The kids would remain with their mom in the home and their dad would move out. “That was really tough for me to handle. I have such a great relationship with my mom and my dad. I can talk to my mom about anything and I can call my dad up anytime – he’s there for me. It took me a long while to make that adjustment. I found a way to deal with it – I’ve moved on,” Malik said. With his parents working long hours, Malik has taken on the responsibility of helping take care of his sisters. He cooks for them and cleans the house. He wants to set a good example for his sisters – protecting them and providing as much as he can for them. He cares a great deal for them – nothing is more important. “I look after my sisters – especially the youngest one, Laila – she really looks up to me – goes to all my games and plays video games with me. It’s really important that I set a good example for her. I want her to be a good person and to treat people with respect,” Malik said. Despite the separation Malik manages to keep in contact with his dad. His dad keeps that competitive spirit in him. He often plays one-on-one with his dad. That has helped him develop over the years in creating his own shot against anyone. “My dad is 44 years old, but he is a tough player. He still has that fire in his eyes. He’s 6’2” just like I am and the same build. That makes things even when we go head-to-head. We’ve had some tough battles. One day I can take him and another day he’ll beat me,” Malik laughs. Malik is now a senior at North Salem High School. He maintains a 3.35 GPA and has a goal to get a 4.0 in one semester. He loves the school he attends. It’s located close to the downtown area with plenty of restaurants or fast-food places to choose. He speaks highly of his teachers at North Salem. “I truly believe that if you treat your teachers with respect, they’ll return the favor. Just be nice to them. One of my favorite teachers at North Salem is my English teacher, Mrs. Gordon, I’ve learned so much from her,” Malik said. As a senior leader on and off the court, Malik encourages his teammates to make good decisions off the court – to him it’s important for them to stay out of trouble. He’s organized some barbeques at his house to create a team bond and some positive chemistry. On the court he has a lot of experience. He’s the only returning senior that started every game last year. He motivates his teammates – shows them how to work hard to prepare for each game. “I have two close friends that I hang around with, Caleb Roberts who maintains a 4.0 GPA and Jerrin Williams who maintains a 3.3 GPA. They are smart in the classroom and a big part of our basketball team,” Malik said. This year Malik is averaging 24.5 points and 4.8 rebounds per game. He has scored 32 points in two games and 22 points in one quarter. He’s hoping to help his team become one of the top teams in the CVC and he believes they can play in the post season – possibly making it to the state tournament. What some people might not know about Malik is that he has done some volunteering for charity. He has helped prepare meals for the Union Gospel Mission. The Oregon Food Bank was another place – he helped deliver food to needy families. Head Coach Jack Martino organized a trip the Salvation Army for the entire team – Malik was involved in helping feed people. “Malik is a great kid – always stoic when he plays. I always say, you never know if he’s up 20 or down 20. You never know if he’s having a good game or a bad game. He just plays! He respects his opponents, teammates, teachers, and coaches. He’s one of the most talented players I’ve coached in my 20-plus years of coaching. Not often will you find a great player and equally great young man,” Head Coach Jack Martino said. Malik’s goal is to do well academically and to play college basketball somewhere. He is currently exploring options. He would like to study physical therapy as a career – possibly becoming an athletic trainer. Some colleges that know of him are Stanford and University of Oregon. Colleges that are very interested are, Eastern Arizona, Oregon Tech, Chemeketa C. C, Corban University, and Clackamas C. C. I’m almost certain that before the season is over he’ll have more knocking at his door. Malik, what is your favorite subject in school? I like Social Studies. I find the different cultures and ethnicities very interesting. I like playing basketball of course, exercising, watching TV, outdoor activities, and hip-hop music. I also like insects – catching gardener snakes – just love the outdoor nature. Los Angeles Lakers – I really like Kobe Bryant. Who is your favorite college team? I don’t have a favorite team, but I love the ACC Conference. What are your two favorite moments? One is winning the CVC title with Avry Holmes two years ago. And also, last year hitting the game-winning shot with seconds left against McKay High School. I split two defenders just short of the three-point line, leaned forward and let it go. The shot was important because it meant us going to the state playoffs. We can’t begin to understand why injuries in sports happen at the worst time. An athlete puts in hours of hard work to become the best athlete he or she can possibly be. All it takes is one time whether in practice or in a game – basketball, football, baseball, etc. No question about it – very disappointing. I tell you with pleasure that this athlete responded in the most positive way imaginable. Micah Sanders is the son of Denny and Linda. He also has a sister, Hannah. Growing up in a middle-income-class neighborhood, he used to play whiffle ball and throw snowballs with his friends. He says those things kind of went away as he got into high school. The environment he grew up in was pretty calm – no real trouble. “I’ve lived in this neighborhood my entire life – grew up in a Christian family. I attended Yoshikai Elementary School and Adams Stephens Middle School,” Micah said. He plays Post for the McKay High School Royal Scots – Central Valley Conference in Salem, Oregon. McKay was off to their best start in years. The 2013-2014 basketball season was shining at the start with a record of 7 – 0 including a win against number-two-ranked Sheldon of Eugene. McKay is a school populated with different nationalities – very diverse. Micah grew up around different cultures – especially the Hispanic culture. Out of 1,837 students, there are 61.4% Hispanics, 25.3% White, and 13.3% Asian/Black students currently attending McKay High School. “I think it’s a good thing – I like diversity. I do believe that cultures affect us on how we react. In high school we are all in the same situation. We do just fine. We joke around sometimes but never anything serious,” Micah said. Micah first learned about basketball when he was two or three years old. His dad played in a church league. Micah would watch and learn – he eventually started liking the game. He kept thinking about playing basketball and couldn’t wait to get on the court. His parents signed him up to play in a Boys and Girls Club league. “I played at the Boys and Girls Club until I got to middle school. I remember always looking forward to the two practices a week and the Saturday games – I really loved it. I never played for an AAU tournament team,” Micah said. Micah improved tremendously since his sophomore year. He trained with Matt Espinoza (Noza) www.dynamicpd.net . He picked up quickly on several basketball skills – especially his accuracy in shooting the basketball. In my opinion, he’s one of the best shooters on the team – he’d be one of my picks to go to the free-throw line. One of the most exciting games McKay has played thus far has been against the Sheldon Irish in Eugene, Oregon. There were several lead changes the entire night and every time a basket was made the crowd roared! Sheldon was a talented squad. Micah was one of the reasons McKay was competing well. He seemed to hit a three-point shot when we needed it or a fifteen-foot jumper to prevent Sheldon from making a run. His rebounding was huge – the final score was McKay 57, Sheldon 51. Micah along with Dillon James, Jacob Brustad, Jorge Garibay, Isaiah Montana, Lorenzo Sterling, and Brandon Lao made up a solid squad of seniors with talent. During the Christmas break McKay was hit hard with injuries starting with Isaiah – a tooth injury, fractured and dislocated finger, and a shoulder injury. Then more players were injured – Jacob with a strained knee and Jorge with a sprained ankle. The bench had to step up (George Smith, Kris Williams, Sam Harris, and Trevyn Roberts) but it wasn’t enough, McKay dropped two games – beating Crater, but losing to North Medford and South Medford at the Abby’s Christmas Classic. As players had a chance to heal up a bit, McKay was facing Canby at home on January 3rd. Isaiah had a taped-up finger and a weak shoulder. Jorge had a sore and taped ankle. At least they were back and good enough to give it a go. Canby was tough and the game went into overtime. Dillon, one of McKay’s best players, fouled out. But McKay still had Micah in overtime. I remember watching the play halfway into the overtime. A Canby guard shot the ball and it bounced off the rim. Micah jumped up in the crowd battling for the rebound. As he came down, he felt a blow to the outside of his knee followed by a pop that he’d never heard before. He went down with excruciating pain – the entire gym went silent and the trainer ran across the floor immediately. His knee had popped out of the socket. McKay not only lost in overtime, but they lost a key player for an undetermined amount of time. “I was so depressed and shocked after that happened. I almost passed out in the locker room. It was tough and there was nothing I could do. Instead of pouting I stayed positive. My teammates encouraged me a great deal,” Micah said. After seeing the doctor, the diagnosis was a torn MCL (Medial Collateral Ligament – inside band on the knee). The good news, no cartilage tear or ACL tear. The trainer had better news than the doctor according to Micah. He will definitely be out for an undetermined amount of time – possibly the season. My prayers go out for Micah to return, but it’s in God’s hands. “Micah has done everything he could to become a better player throughout the last three years that I have known him. It was hard to see his season come to an end, but I have been impressed with the role he has taken on since then. He has been a true leader for our team,” Assistant Coach Matt Espinoza said. Micah has high hopes to return to the court by the end of league play. With his attitude I have no doubt it could happen. But for now he’s not just sitting around the house. He is supporting his teammates during practices and games. He gets up off the bench and gives pointers to help out. He’s been around the league a long time and knows some of the opponents well – his knowledge is valuable and an important factor. “Micah is the ultimate teammate. He did all of the little things well on the floor. The biggest asset he brings to the team is his leadership. Even with his injury he’s still bringing that to the team,” Head Coach Dean Sanderson said. Micah’s sister, Hannah, was never that supportive of her brother previous to his senior year. She would show up to his games but was not that thrilled about being there. During his senior year her attitude changed drastically – she had much more enthusiasm. “I’m amazed at how well he’s handled everything. I’m more supportive of him now than I ever was before – I’m very proud of my brother,” Hannah said. Micah is an honor student and maintains a 4.0 GPA. He likes taking AP classes although McKay doesn’t offer many. He is blessed with a good memory that retains what he learns well. He focuses on doing the best he can as far as homework or whatever needs to be done in class. Before taking tests, he reviews criteria that might not be as clear. His plain and simple words, I just don’t accept Bs. This young man has goals. One is to graduate high school with a 4.0 GPA. He also believes that his team can win a CVC League Title and play in post season. A trip to the Moda Center (formerly known as the Rose Garden) is definitely not out of reach. As a senior he would love to be one of the Valedictorians at graduation. Micah feels his senior class is a great one and can leave an inspiring impression for the underclassmen. What some people might not know about Micah is his involvement doing mission work through Salem Alliance Church – he takes great pride in his faith. Mexico is a country he visited in the past – he helped build houses for people in need. This summer he plans to do mission work in Africa (Burkina Faso) – he’ll be there for two weeks building church roofs. I personally will pray for a speedy recover for Micah Sanders, he is a young man that has set a great example for young people to follow – not just in sports, but in life as well. Micah, what are some of your hobbies? I like playing drums and helping out in things like the Salem Hoops Project. I enjoy the outdoors – hiking and stuff. I’m not a big fan of video games but I do listen to Christian music. I like rooting for the underdog. I like colleges like Butler and Davidson. What are your goals past high school? I plan on applying at Whitworth and Northwest Nazarene. At this point I don’t plan on pursuing sports. I would really like to see what colleges have to offer without spending a lot of time on a sport. For a career I really like Kinesiology (assessing patient’s health by testing their muscles, etc.). I’m so convinced that any team with a desire to make it all the way to the state tournament must have put in some extra time on the basketball court. Like the boys in this story, it doesn’t matter where any of the players came from, the important thing was how they blended well when it came to fearless competing. In Keizer, Oregon, five seniors coached by Larry Gahr led the way for the 2001 McNary High School Celtics. Wow, has it really been that long? Here it is already 2016 and I remember it just like yesterday. I’m proud to say that one of those players in the photo is my son, Jake. Number 12 Brian Zielinski, 10 Chad Harms, 32 Ryan Medford, 52 Jake Espinoza, and 44 Clark Ellison, were the seniors leading the way to a successful season. Two other seniors that were major contributors were Jamie Reznick and Tony Alefanti. Juniors were Trevor Cross, Ryan Schmidt, Drew Miller, and Grayson Boucher. How did this all happen? Well, let’s take a look at four of the players. Chad, Brian, Ryan, and Jamie were playing together since the grade school days. They all had supportive parents that would go miles out of the way for their child. They played in an organized basketball league called the Skyball League and they represented Whiteaker Middle School. In addition, they played for a tournament team that traveled to different cities. I remember seeing the nice uniforms and sweatpants the players wore. Jake played for Adam Stephens Middle School which participated in the same Skyball League. None of the kids at Stephens played on a tournament team. When Jake’s team played against Whiteaker in the seventh grade, well, the first half was close, but the second half was not a pretty sight. Whiteaker went on to win by 20 points. Ryan Medford at the time was probably 6’ 0”. Jake was maybe 5’ 7” and the best ball handler at Stephens. Brian Zielinski was a factor stealing the ball several times from some of the inexperienced Stephen’s players. Jake tried out for the Keizer Celts eighth-grade tournament team the following year. This was the only local tournament team that we knew of at the time. I wanted my son to play in tournaments, not just the Skyball league. Jake made the team and started playing with Chad, Brian, Ryan, and Jamie. They started to get to know each other throughout the years. There were some uncomfortable moments at times due to Jake breaking in as a new member. But as time passed adjustments were made and things got better. Clark Ellison didn’t come into the picture until his freshman year in high school. He was a transfer from Chicago and did not play basketball at McNary his freshman year. Clark was an athletic kid that could play ball, but he needed to learn the McNary offense-defense program. He joined the team his sophomore year where he played JV with Jake, Chad, Jamie, Drew, and Grayson. Brian and Ryan were moved up to play varsity as sophomores. To be honest, I knew this team would be tough contenders just from watching them for years. Most of these players were leaders in their own way. There was plenty of drama, not just in the players, but in the parents as well. The officials had their hands full when the parents were at these games. I’m including myself as well – I’m not too proud of some of the comments I made to officials when they missed a call. This group of guys all came together through Larry Gahr’s basketball program by their senior year. Just how, I’m still not sure. Every senior on this team was different – unique in their own way. They all had different hobbies, they all were raised different, and they all had different study habits. But the one thing these boys had in common was the competitive spirit and the drive to win. To this day, I feel for Coach Gahr and his staff. I commend the coaches for making it through challenging years – keeping those kids together the best they could. I mean, I'm so thankful for the study tables they had to keep the athletes’ grades up. Also, the talks during practice and after practice, were helpful. Another challenge was dealing with the parents – Lord knows that’s always a challenge. I’m sure there were more I didn’t know about. Back in 2001 our conference was called the Valley League which consisted of 10 teams. Class 4A (Big schools’ league), McNary; Crescent Valley; North Salem; South Salem; Sprague; Lebanon; West Albany; South Albany; McKay; Corvallis. The top four teams made the playoffs and sixteen teams from the state made it to the OSAA State Tournament at Memorial Coliseum. This is where the Blazers played before the Rose Garden and Moda Center came into play. There were no superstars or go-to players on this team. Everyone contributed. Each player knew their role and executed it precisely. Coach Gahr put in many offensive plays, defensive presses, etc. I used to watch some of the practices – amazing the things these kids learned. They were all very smart and aggressive – that certainly helped. During high school Jake grew 4 and ¾ inches from his 6’0” freshman year to his senior year – he stood at 6’4 ¾”. Ryan grew four inches standing at 6’4”. Clark grew to 6’3” and could jump like a rabbit. We started hearing the term “Terrorizing Trio” referring to the three big guys we had. These three were strong, fast, and didn’t back down from anyone. They all would rattle the rim in practice. Chad and Brian were our guards that rarely turned the ball over. They took care of the basketball ball and they ran the offense. The defense was intense from these two little guys. The three-point percentage was great as well. It was not usually a big deal if any of the five fouled out, because the others would step up – McNary was deep in that sense. This made the case of a winning season in league play. But with one game left in the playoffs before advancing to state, they had to face Beaverton, Oregon – winners of the Metro League. The winner would move on to the State Tournament. I can still hear the standing-room crowd. I had never seen a high school gym so packed. All you could see was people everywhere. It was an intense game and every shot counted – the pressure was amazing! The intensity from every player was felt. Clutch free throws made by different players in the end helped seal an overtime victory defeating Beaverton 53 – 50 and earning a birth to the OSAA State Tournament. The Celtics were on their way to Portland, Oregon! The team goal was to play on Saturday. On Wednesday, March 07, 2001 McNary would face Roseburg, Oregon, at 7:00 pm inside Memorial Coliseum. They were facing 6’7” Joe Newton, 6’6” Brennan Gavrelts, and 6’5” Alex Williams – a lot taller than McNary. The entire year every player on the team had their shining moment – it was like they took turns. But on this stage at the state tournament, it was Jake Espinoza who shined like an all-star. It brought me to tears watching him play his best game of the season. Most of you will never know what he and I went through for years – it wasn’t easy. I love my son to this day and stood by him every day. Jake led all scorers with 19 points and he pulled down 10 rebounds – a double-double. Ryan scored 9 points, Drew Miller scored 8, Chad had 5, Clark had 4, and Brian led all players with 4 assists. McNary defeated Joe Newton and the Roseburg Indians, 57 – 45. They held Joe to only 15 points. The team goal was met, they played on Saturday. They lost to nationally-ranked Jefferson High School on Friday and rivalry South Salem on a down-to-the-wire game, 58 -61. We were all so proud of these guys for such an amazing season – a record of 20 wins and 7 losses. Four out of the five seniors went on to play college basketball and contributed significantly to their teams. One went on to play college baseball. Memories like this are never forgotten but treasured.